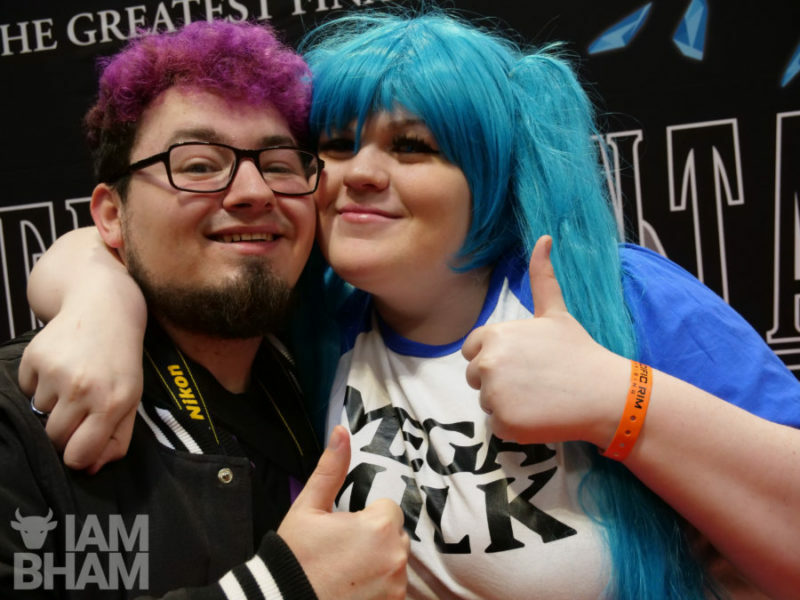 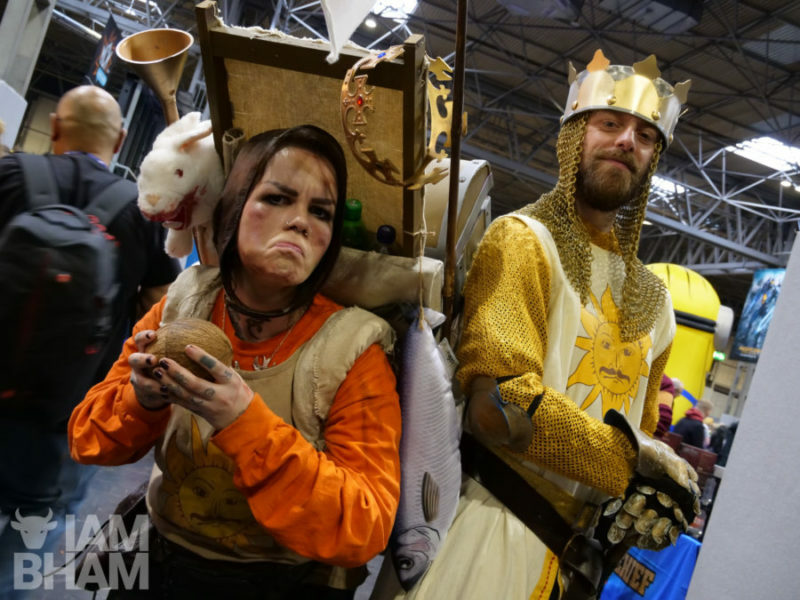 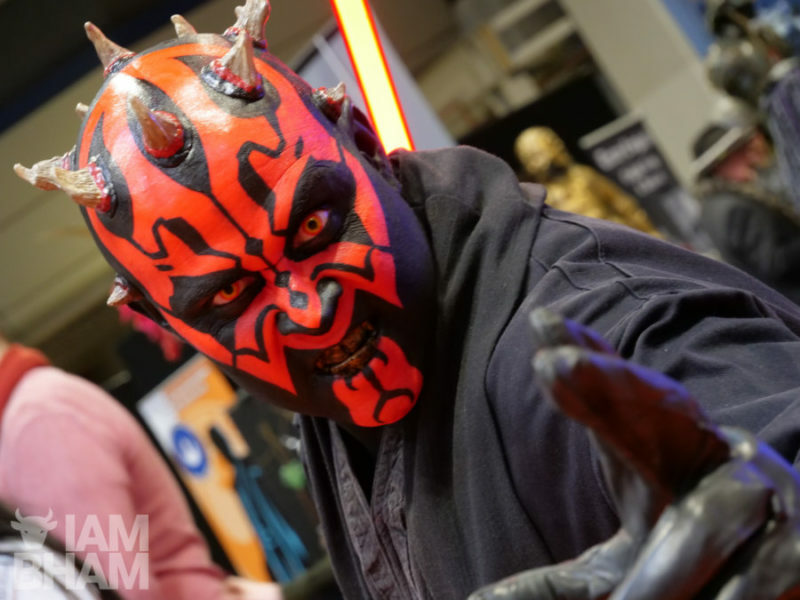 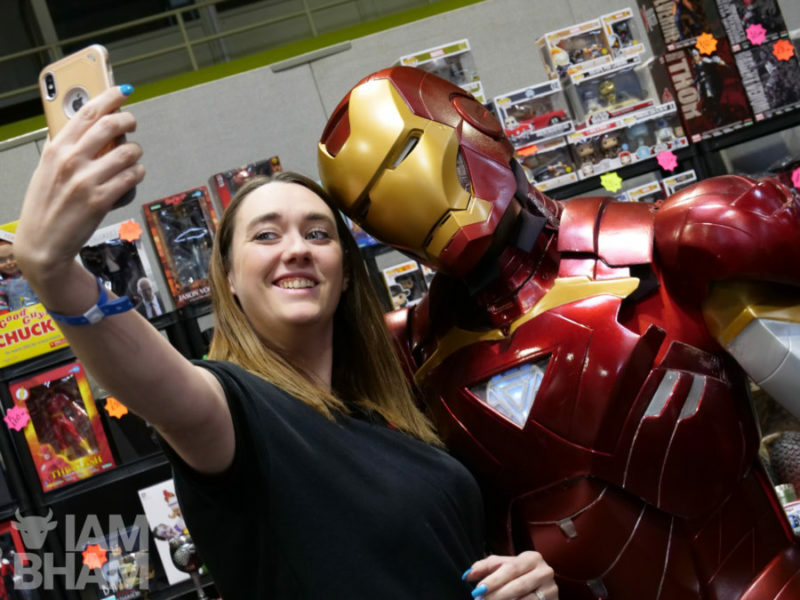 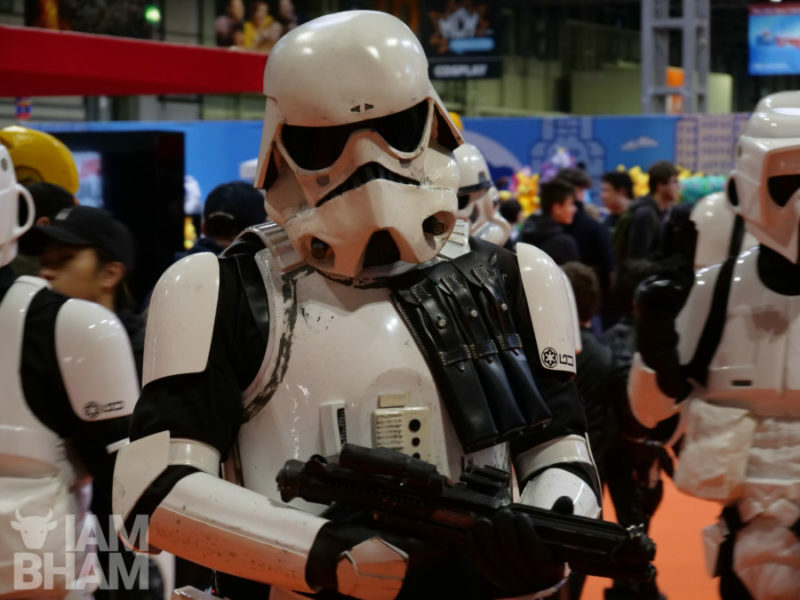 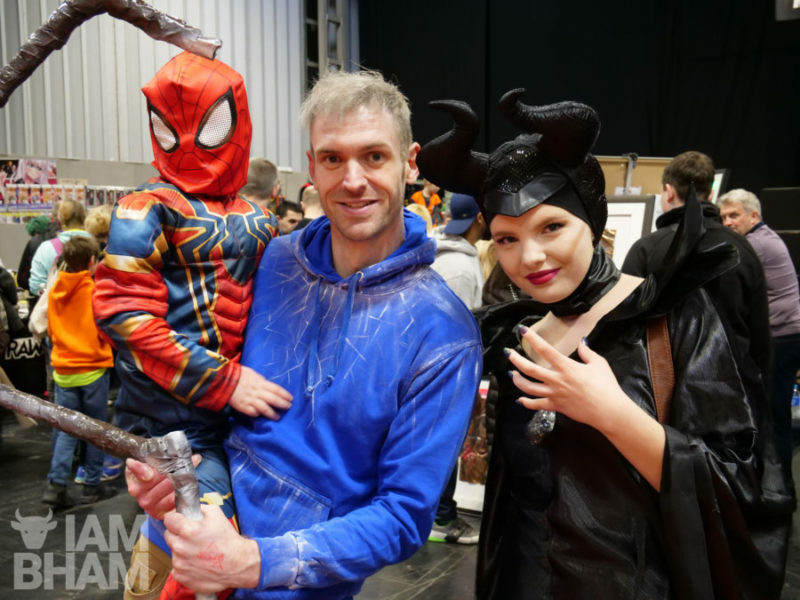 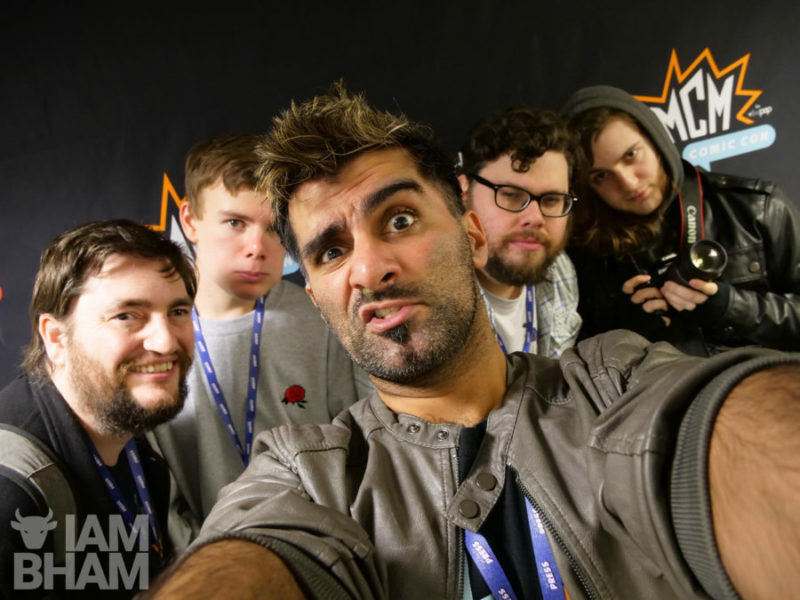 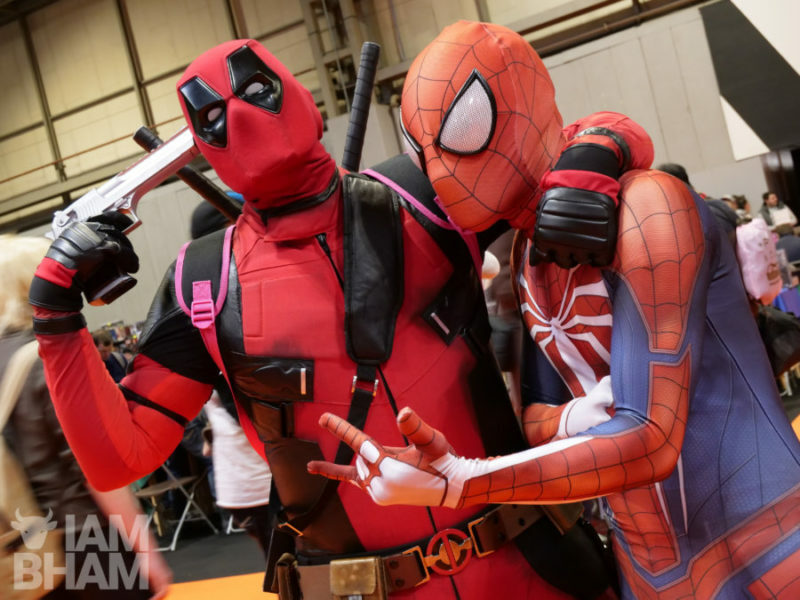 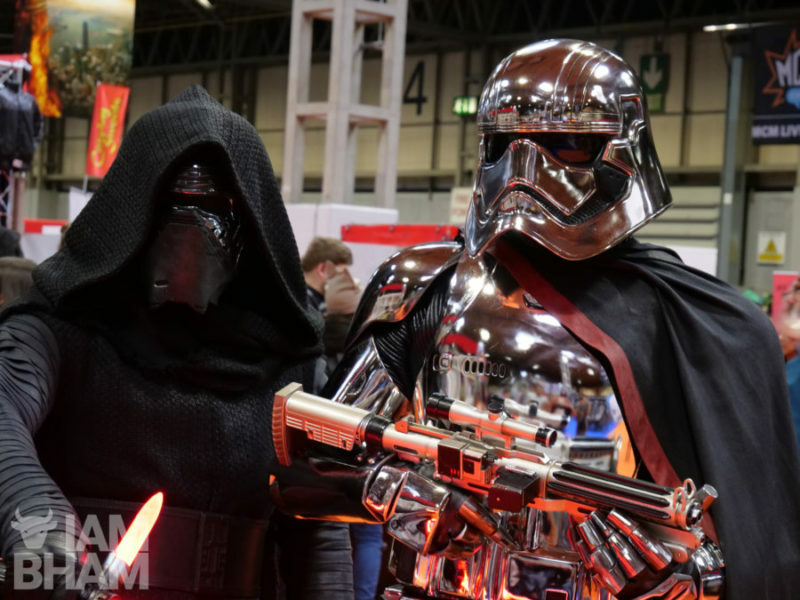 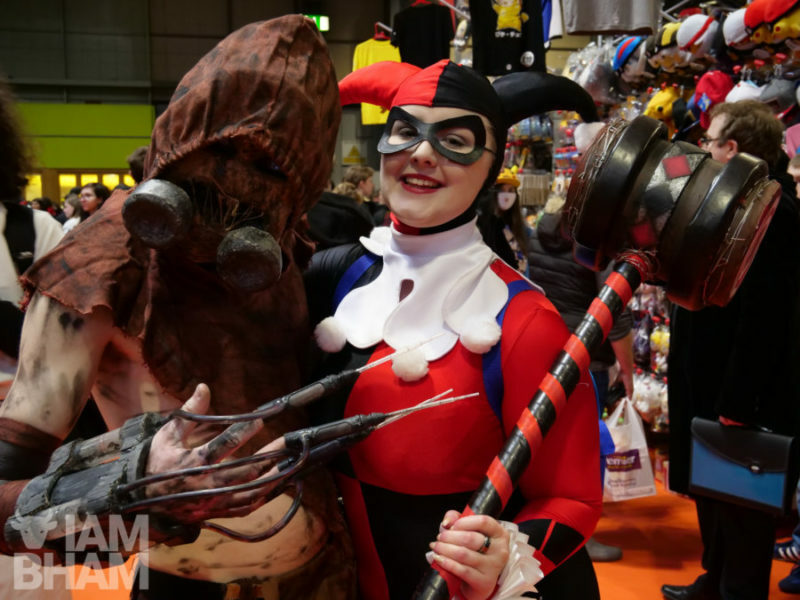 It’s MCM Comic Con weekend with celebrities, cosplayers, gamers, animators and comic artists all under one roof at the NEC in Birmingham. 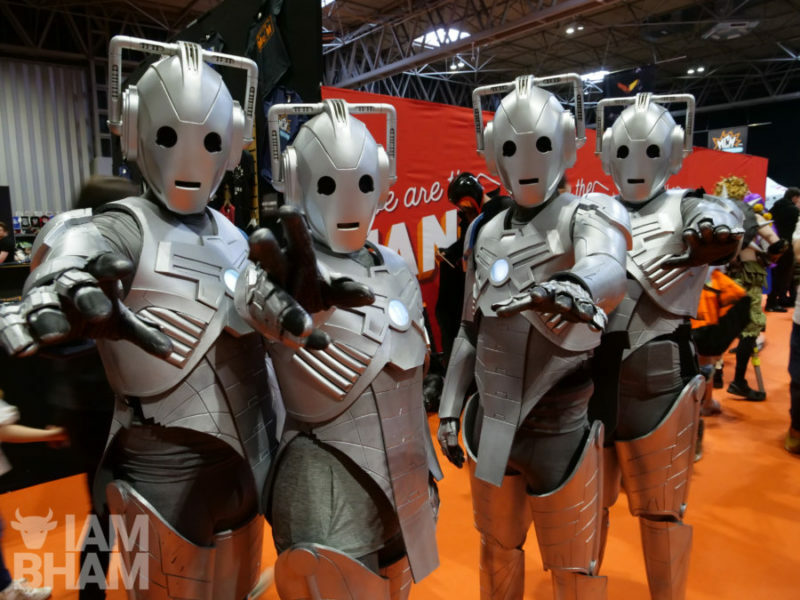 We’ll have full coverage during and after the event, and regularly sharing live updates as they happen too. 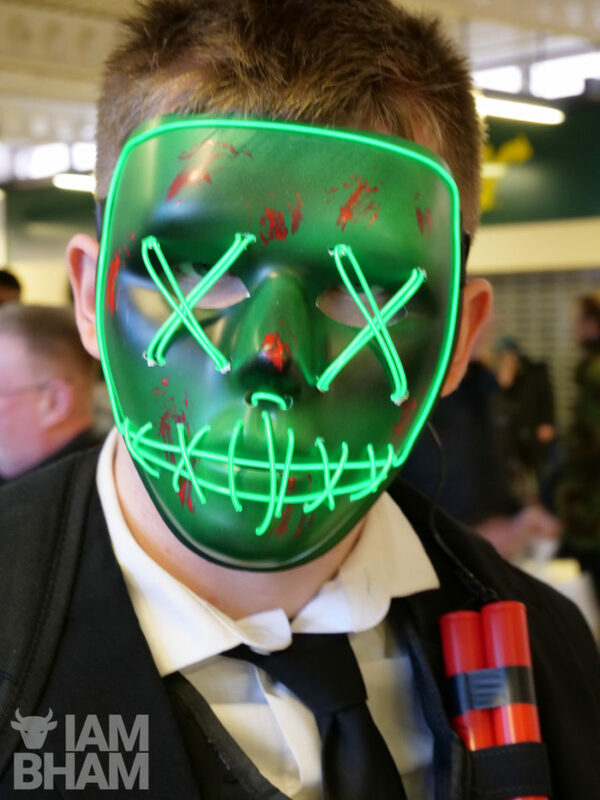 Keep checking back for coverage below and on our Twitter account. 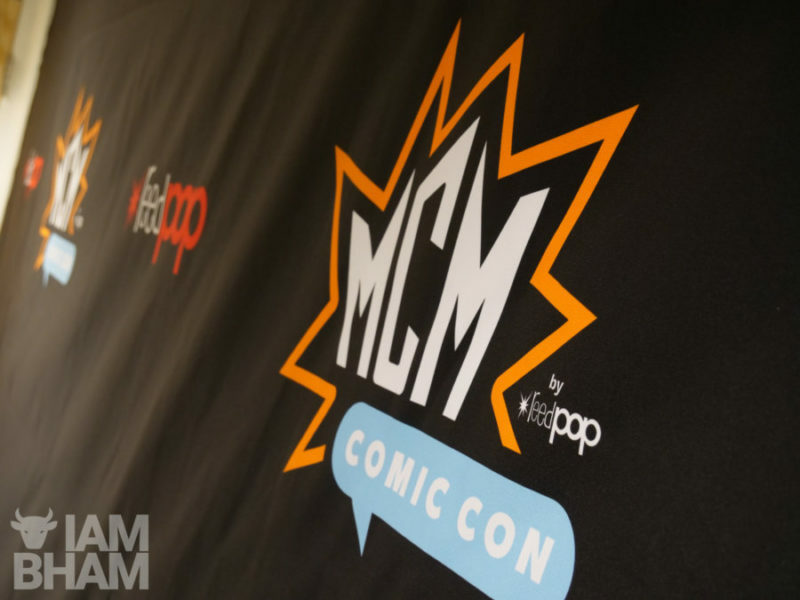 14:30pm: We’ve been catching up with Supernatural and Firefly star Mark Sheppard at the MCM Comic Con in #Birmingham today. 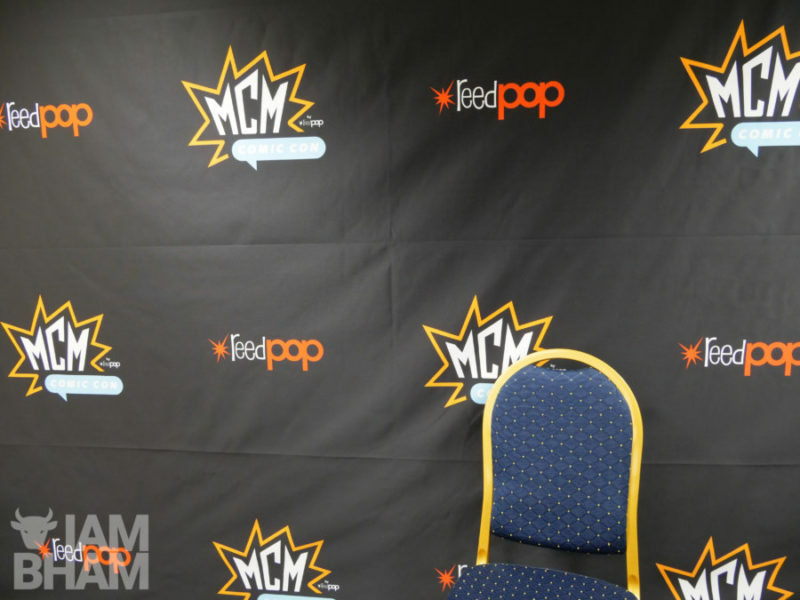 Unfortunately, he wasn’t allowing photographs like the other guests, so here’s a shot of his empty chair. 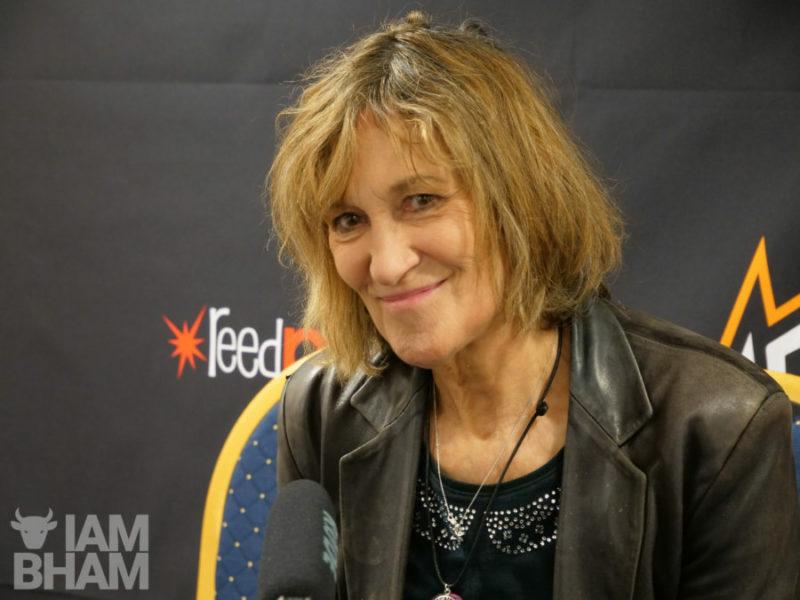 11.00am: We’ve just been catching up with Jan Chappell of Blake’s 7 fame. 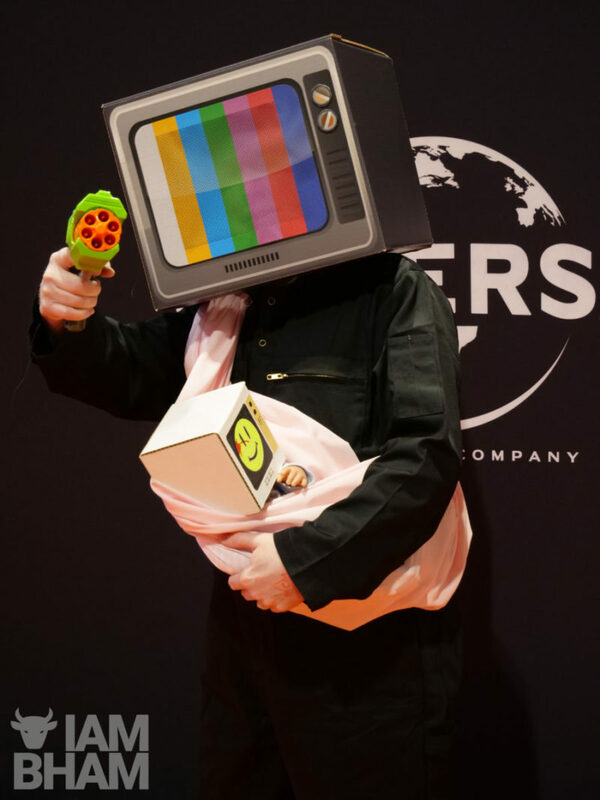 Blake’s 7 was a cult BBC science fiction show which ran between 1978 and 1981. 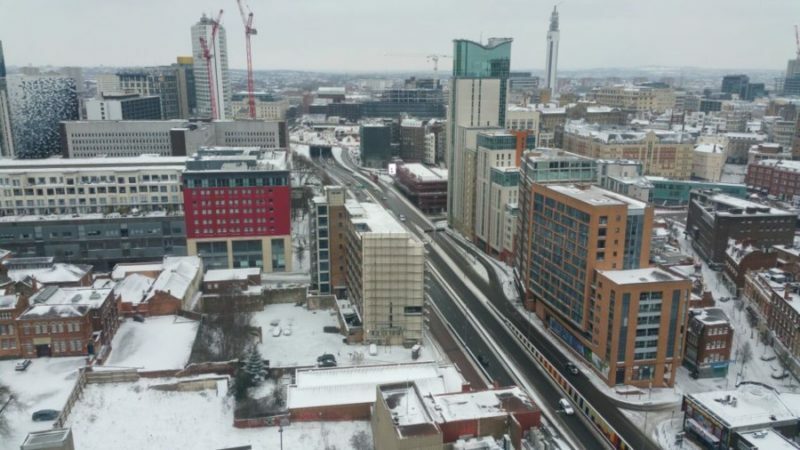 10.00am: It is a expected quieter day today than Saturday, but there doesn’t as yet seem to be a huge lack of numbers due to weather conditions. 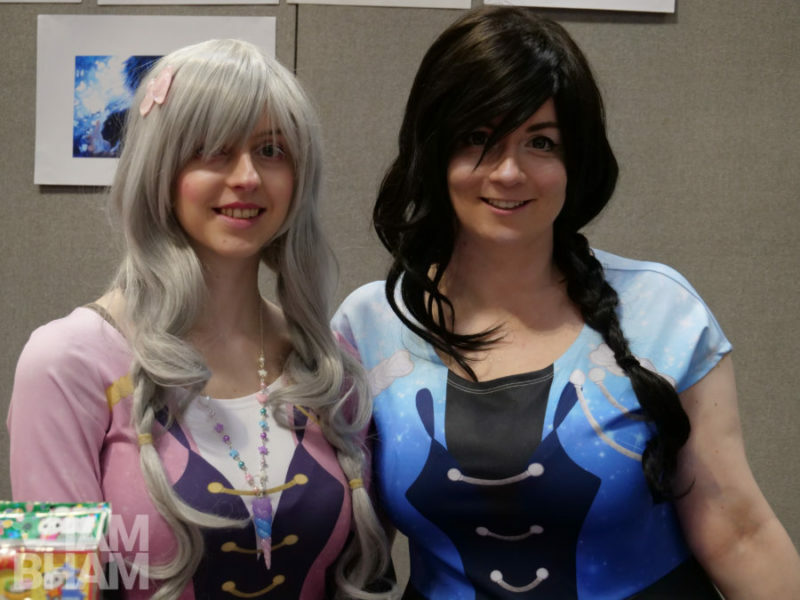 Although we’re sure many are having a lie-in! 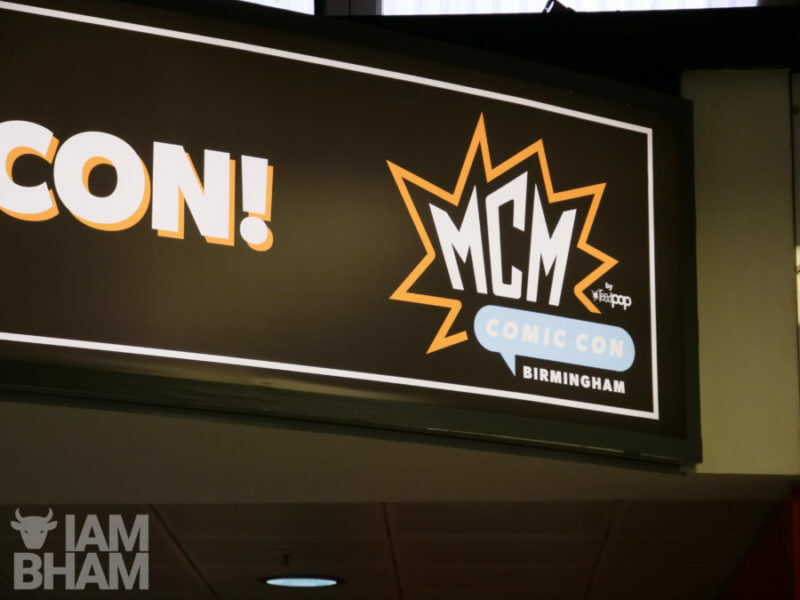 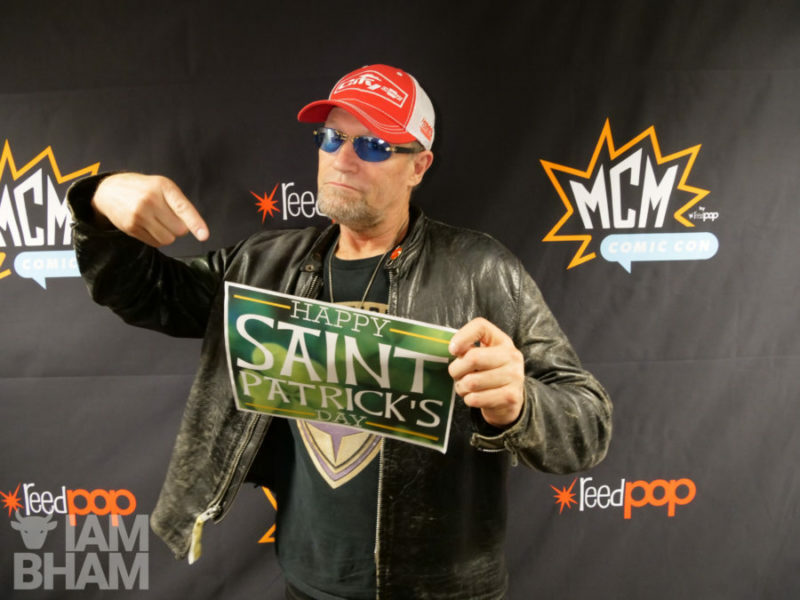 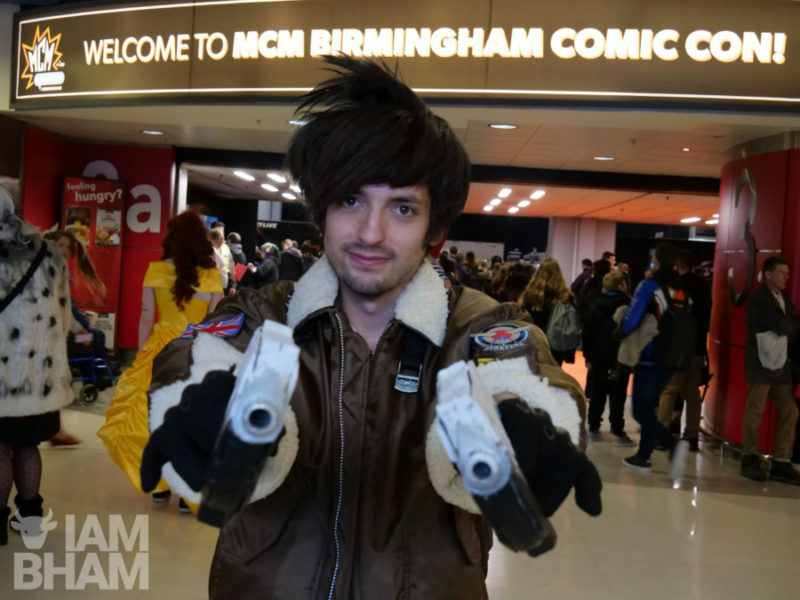 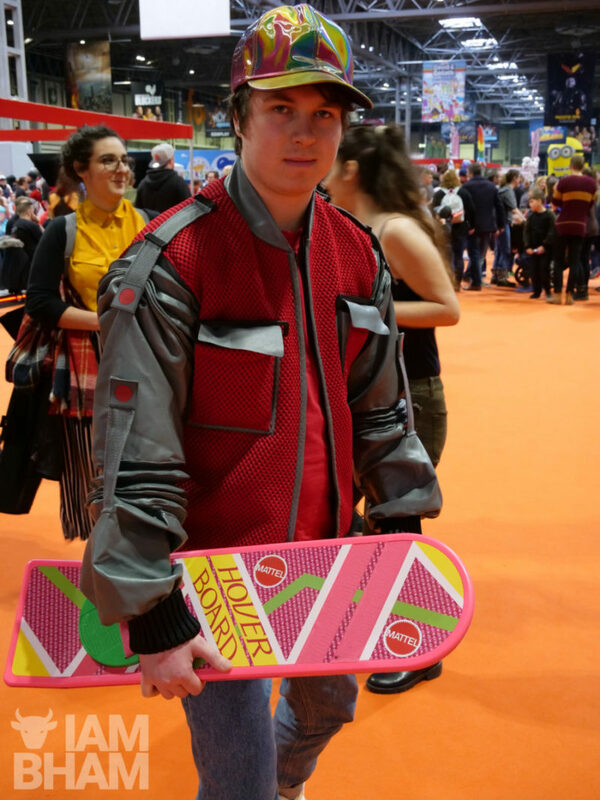 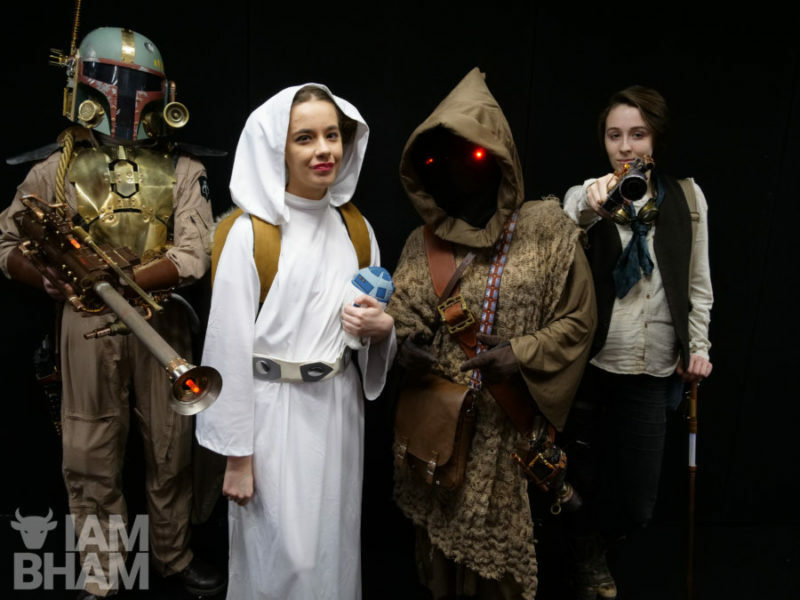 9.00am: Day 2 of MCM Comic Con in Birmingham begins at 9am on Sunday 18 March. 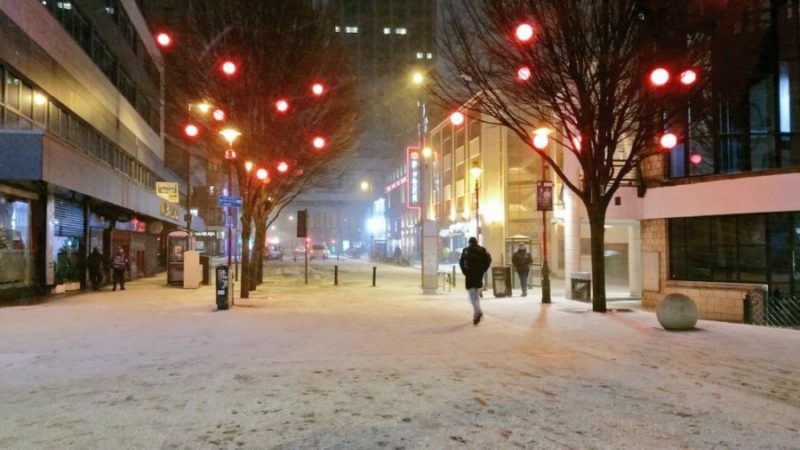 The weather is much colder than yesterday, with temperatures remaining at -3°C from overnight. 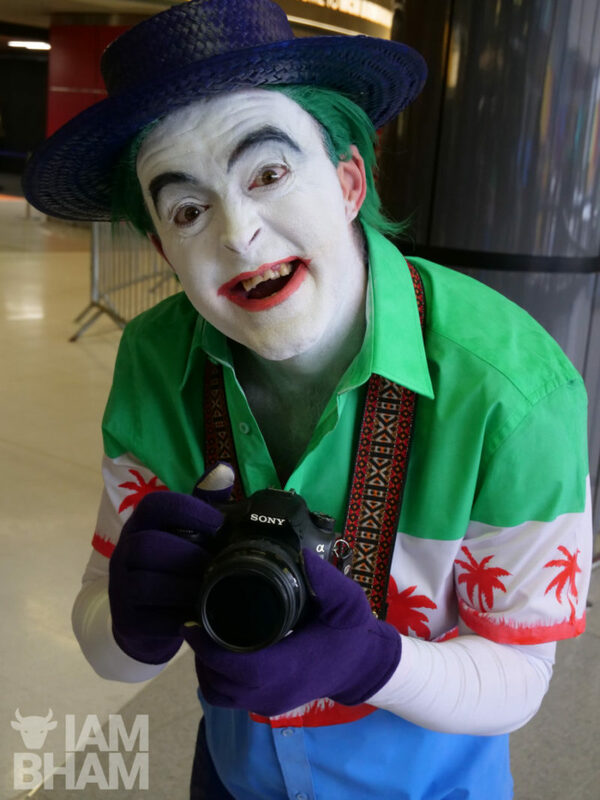 Will this deter attendees and cosplayers today? 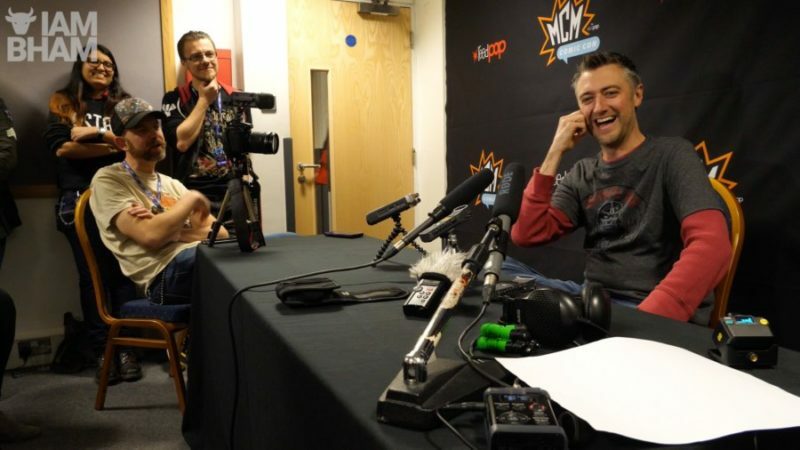 We’ll find out very soon! 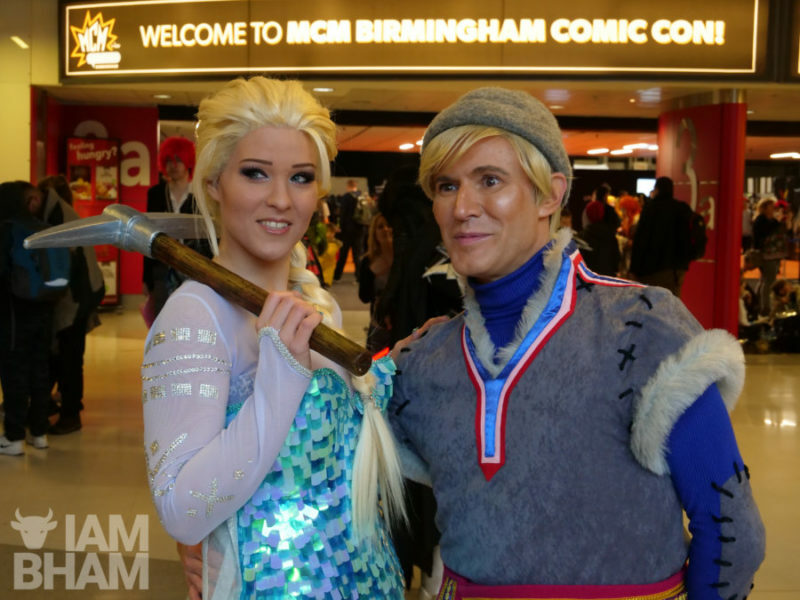 6.00pm: As the first day of MCM Comic Con draws to a close, it is snowing across the city and appears to be settling. 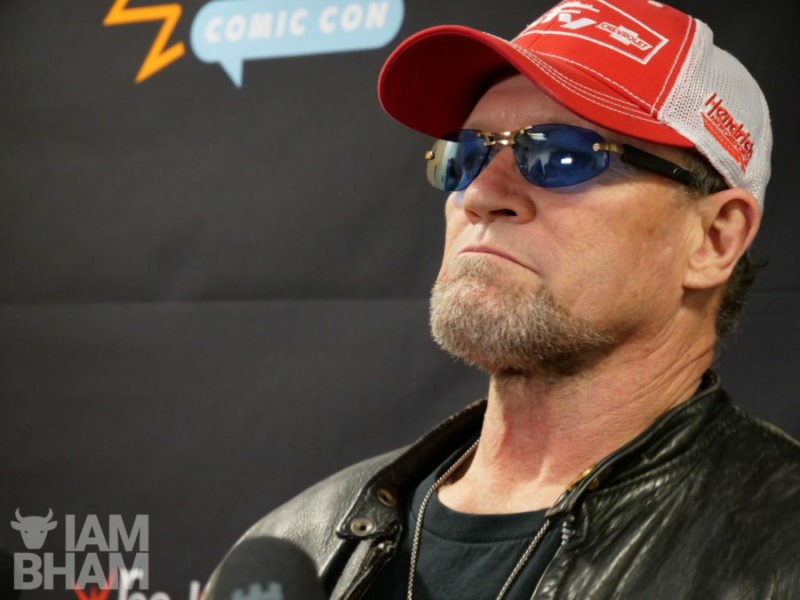 3.40pm: Veteran Hollywood actor Michael Rooker has been an absolute delight, discussing his various roles over the decades, including his more recent Marvel comics roles which have gained him a cult following. 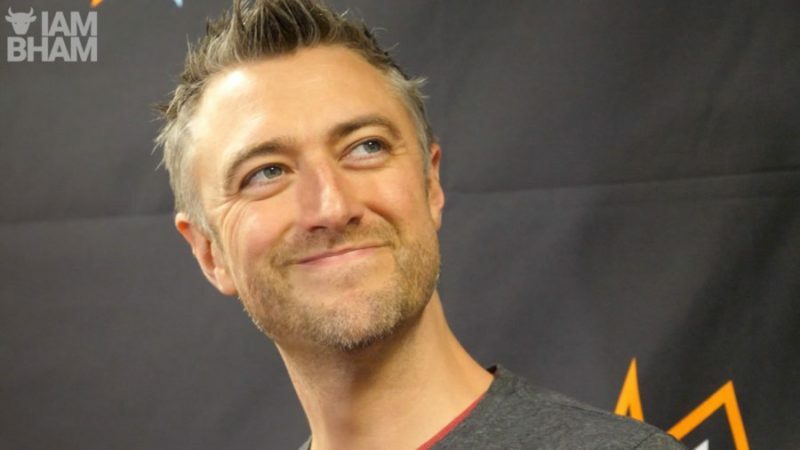 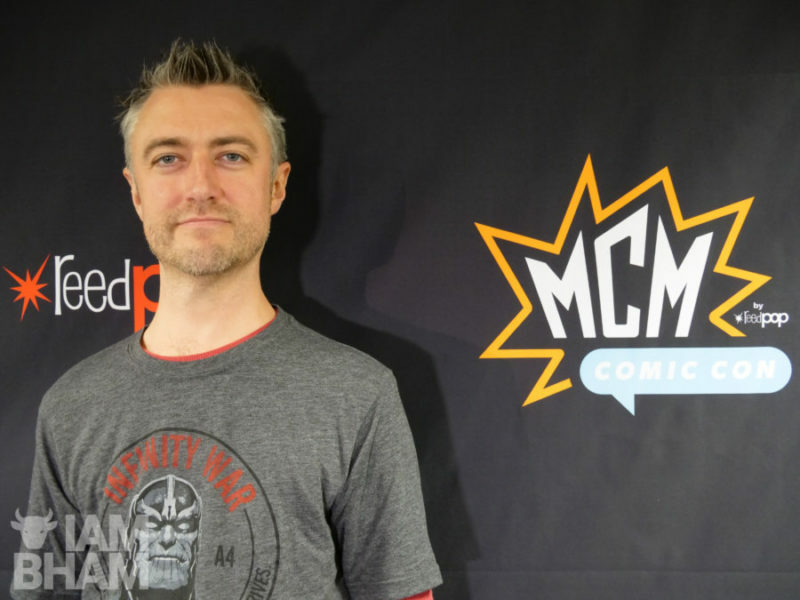 3.00pm: We’ve just been chatting to Guardians of the Galaxy actor Sean Gunn at MCM Comic Con in Birmingham. 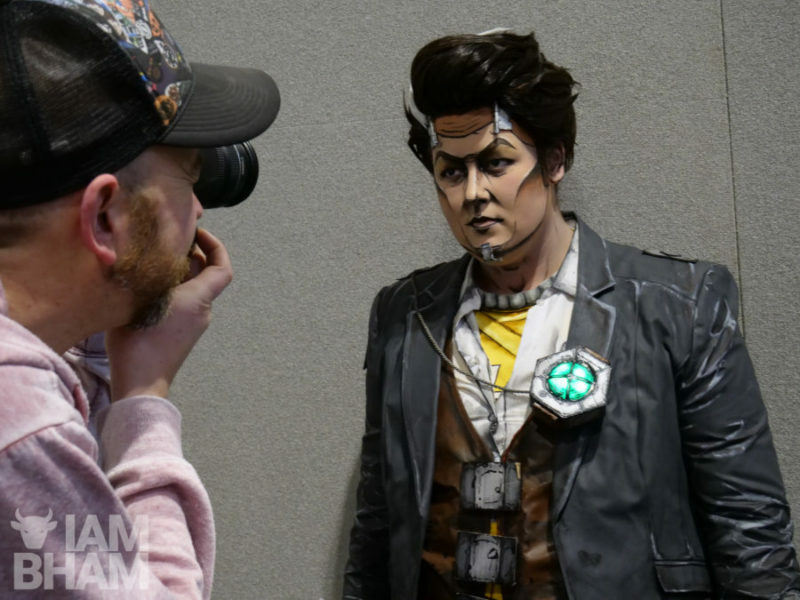 He had much to share about his role in the franchise and on working with his director brother James Gunn. 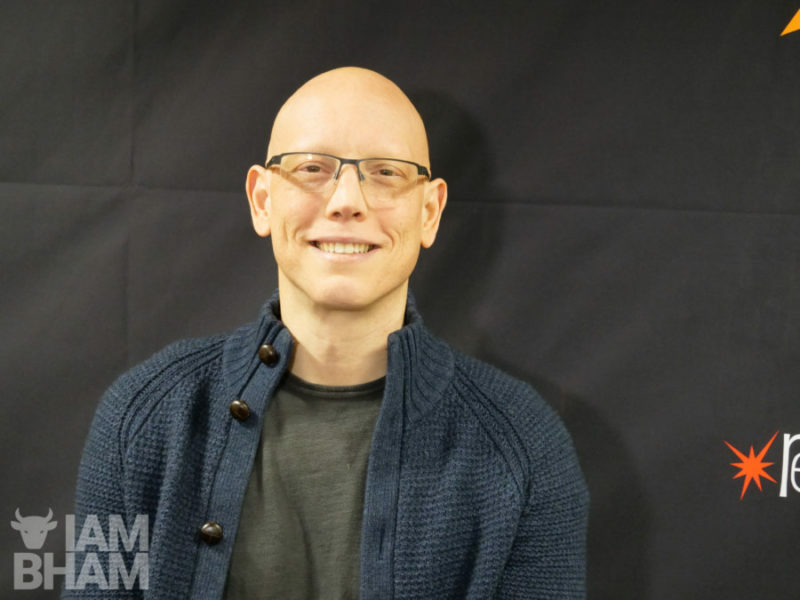 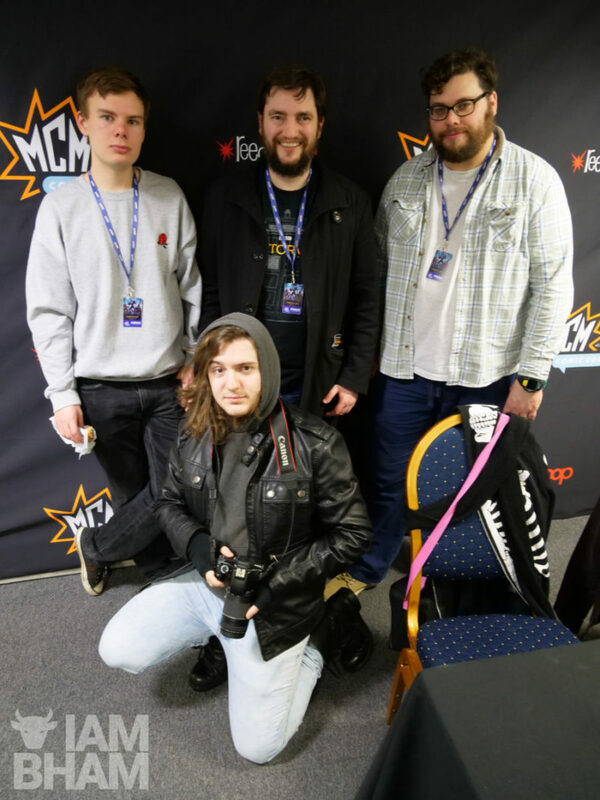 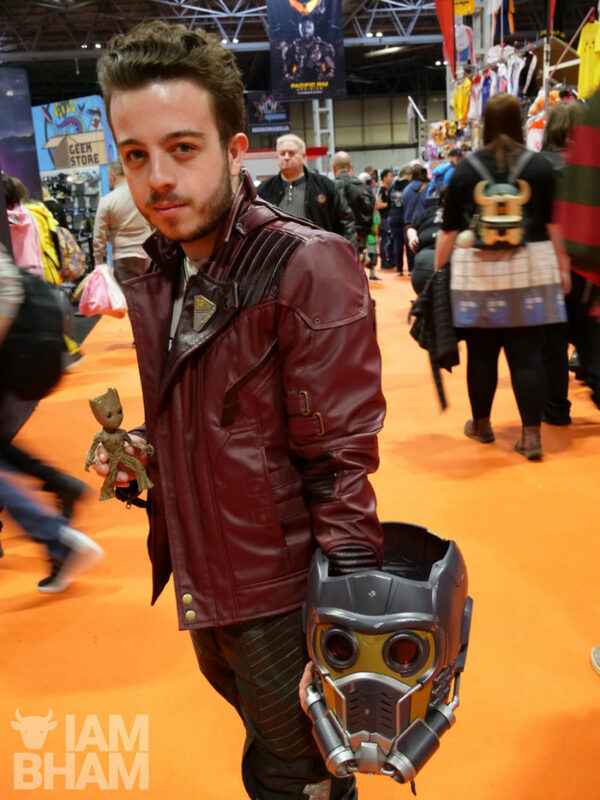 I Am Birmingham journalist and film buff Olly MacNamee probed as far as he could about upcoming projects, but Gunn kept pretty schtum on details about Avengers: Infinity War. 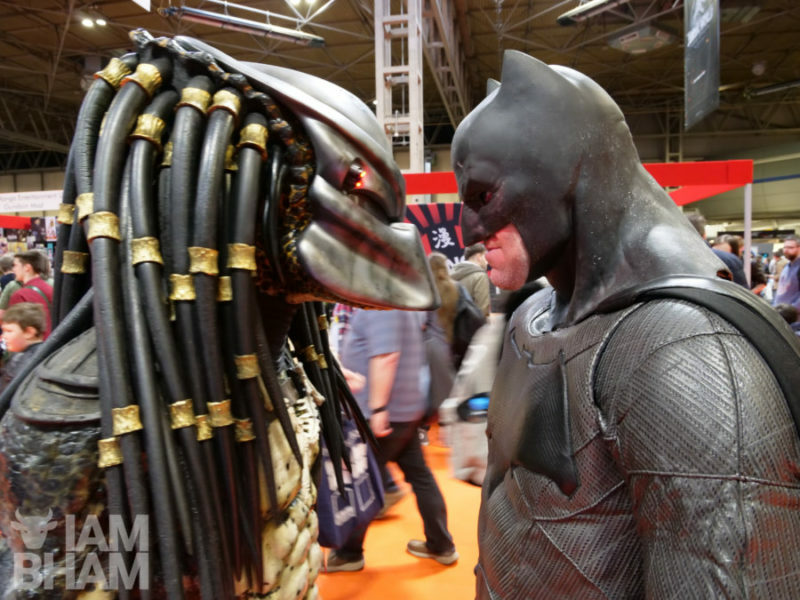 Oh secrets, secrets. 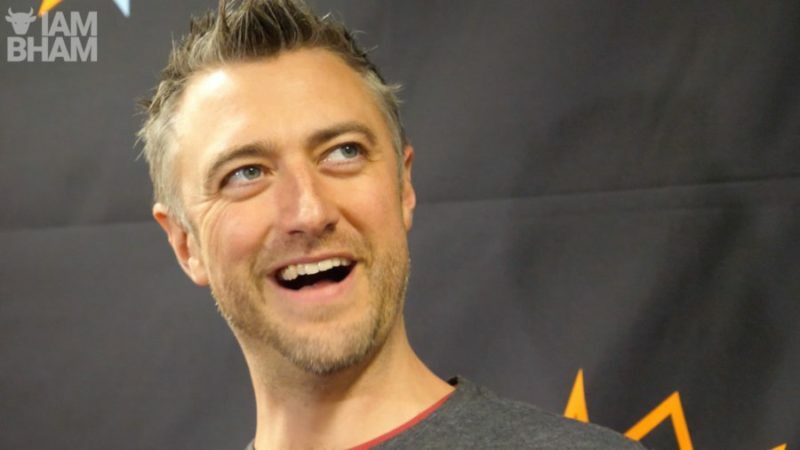 1.15pm: We catch up with Canadian-born comics artist David Finch, known for his work on Cyberforce, and numerous subsequent titles for Marvel Comics and DC Comics including The New Avengers, Moon Knight, Ultimatum, and Brightest Day. 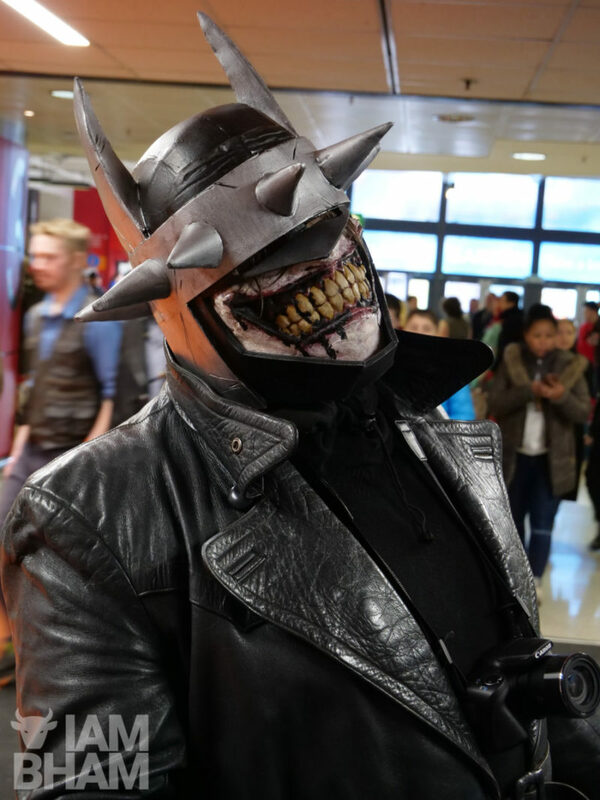 He’s also provided album cover art for the band Disturbed, and done concept art for films such as Watchmen. 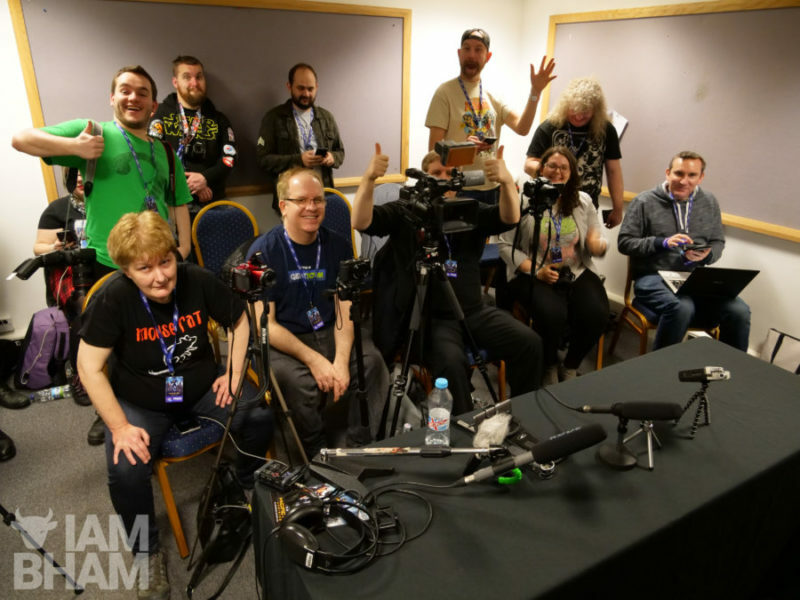 12.20pm: Press are waiting for MCM Comic Con Birmingham headline stars Michael Rooker and Sean Gunn of Guardians of the Galaxy fame, but it appears their interviews are to be postponed as they’re swamped by fans in the autograph pen! 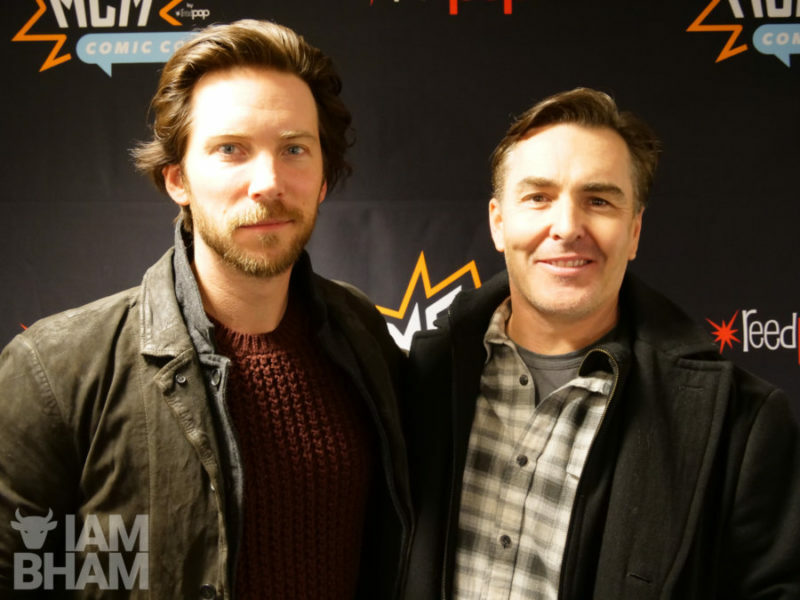 10.00am: Video game heroes and voice artists Nolan North and Troy Baker are discussing their acting work at the first of today’s press interview panels. 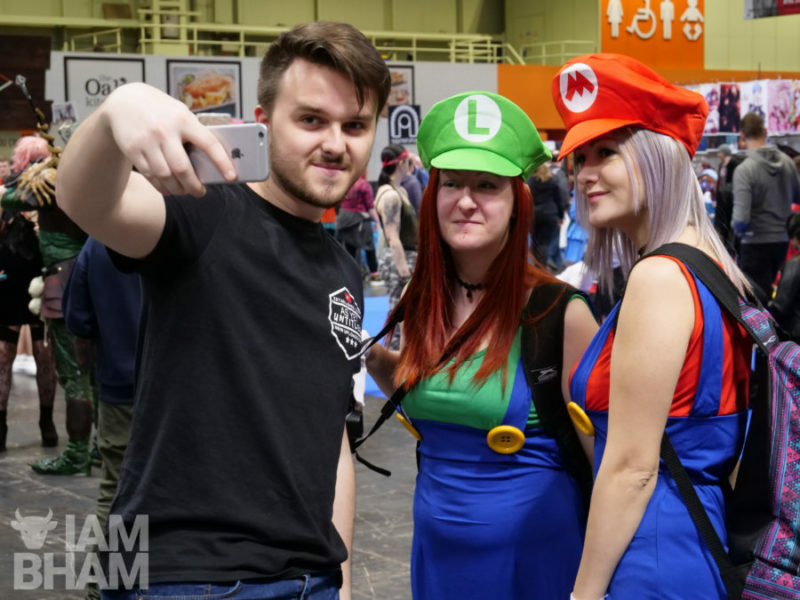 9.30am: The NEC is quite busy already, with more fans still coming in. 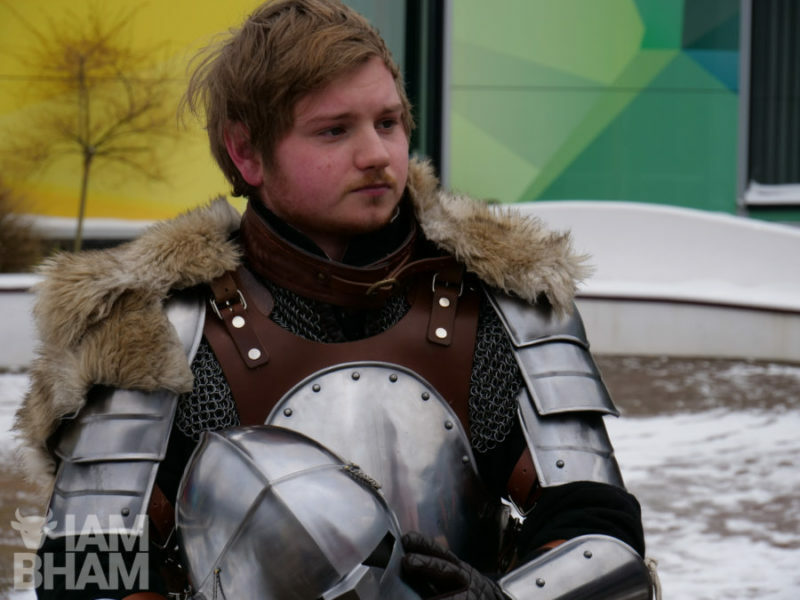 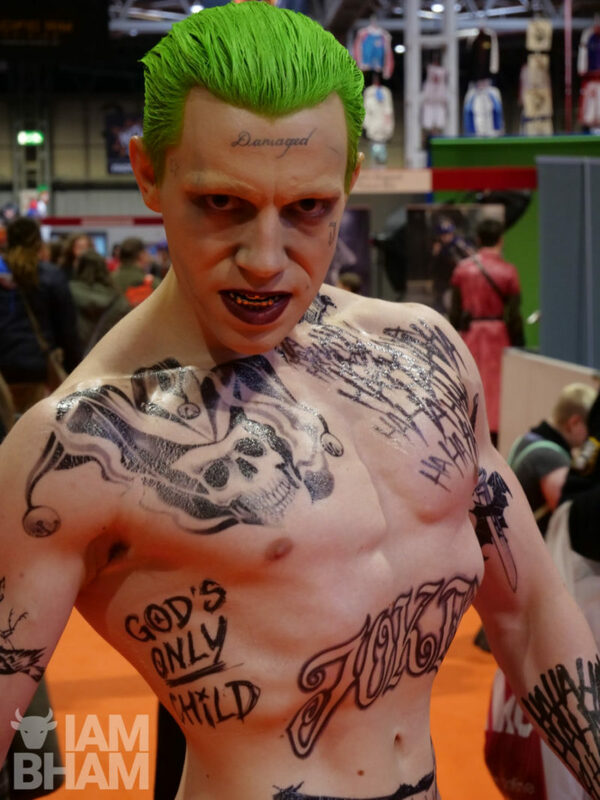 There’s some pretty impressive cosplay. 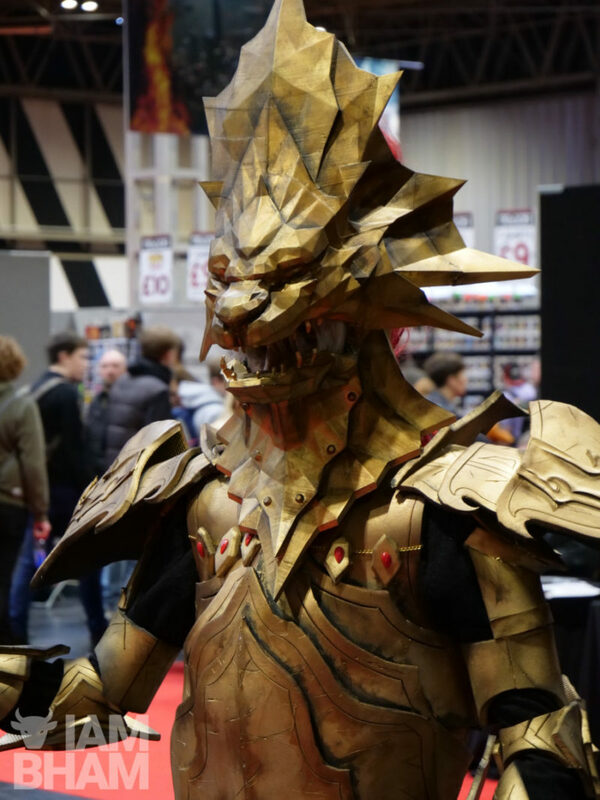 Here’s a few awesome efforts we’ve spotted already! 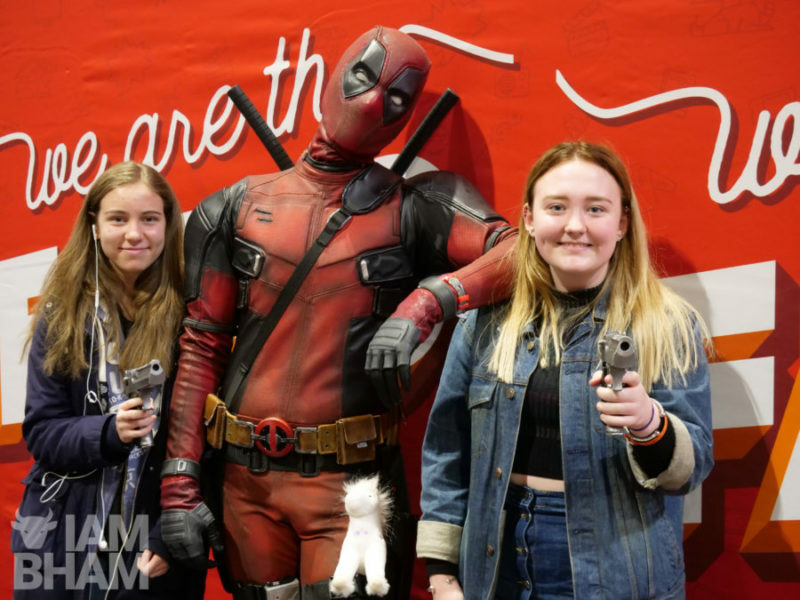 9.00am: The show has opened with hundreds of comic, TV and movie fans queuing for tickets; some of whom have been waiting since yesterday! 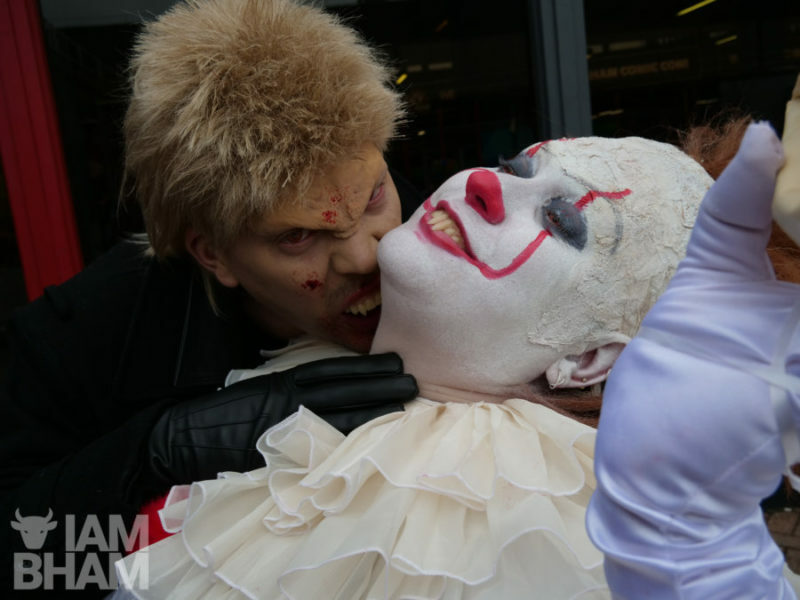 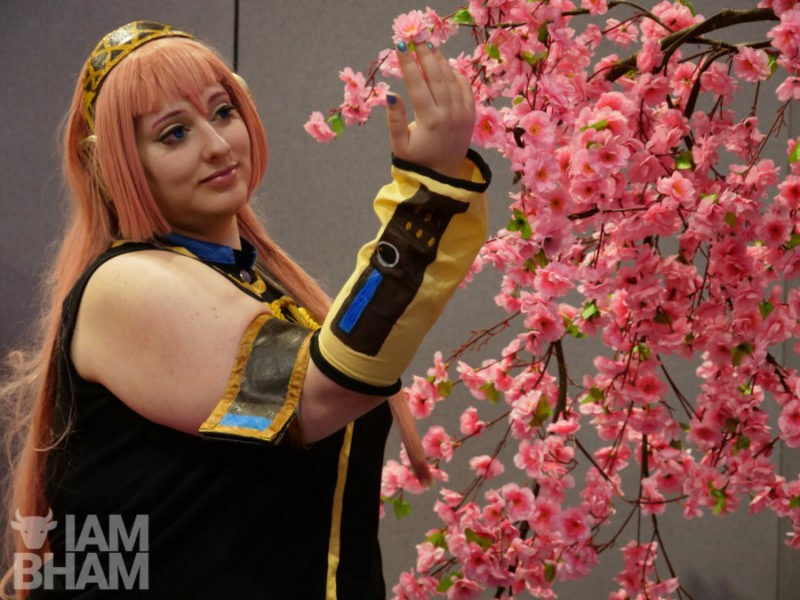 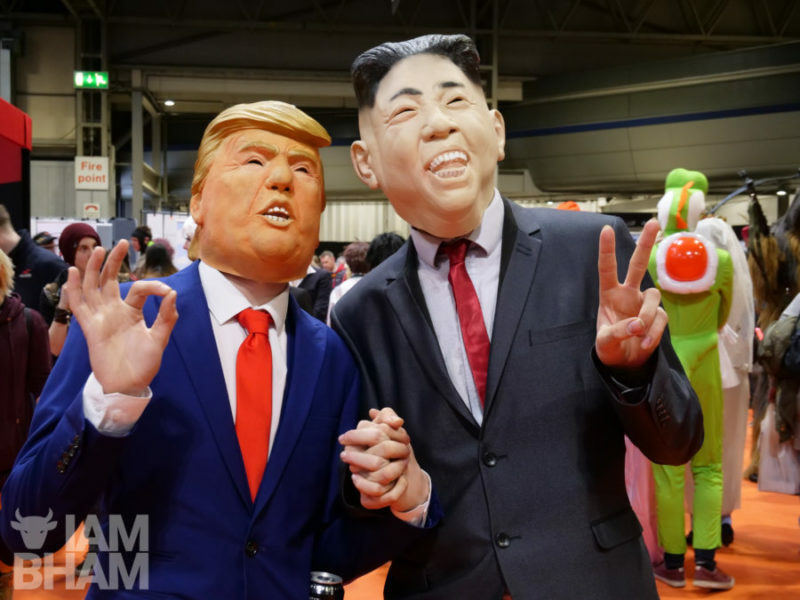 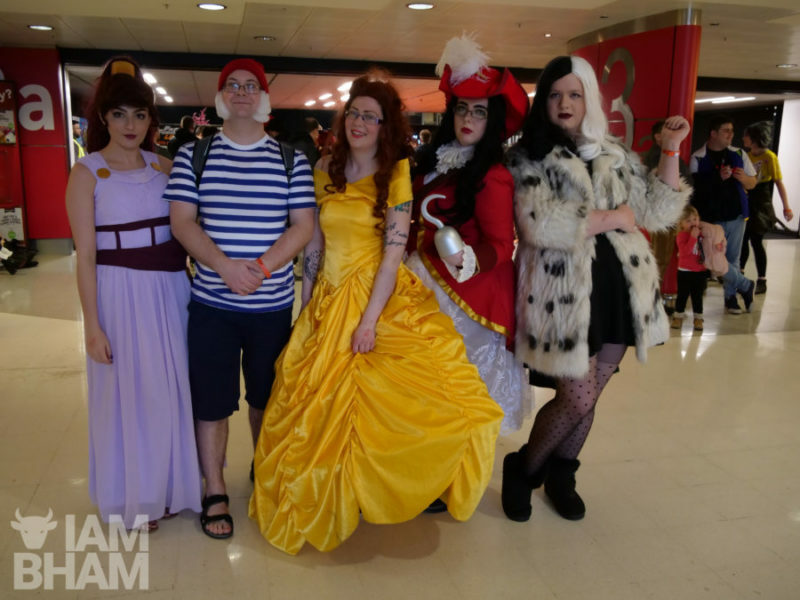 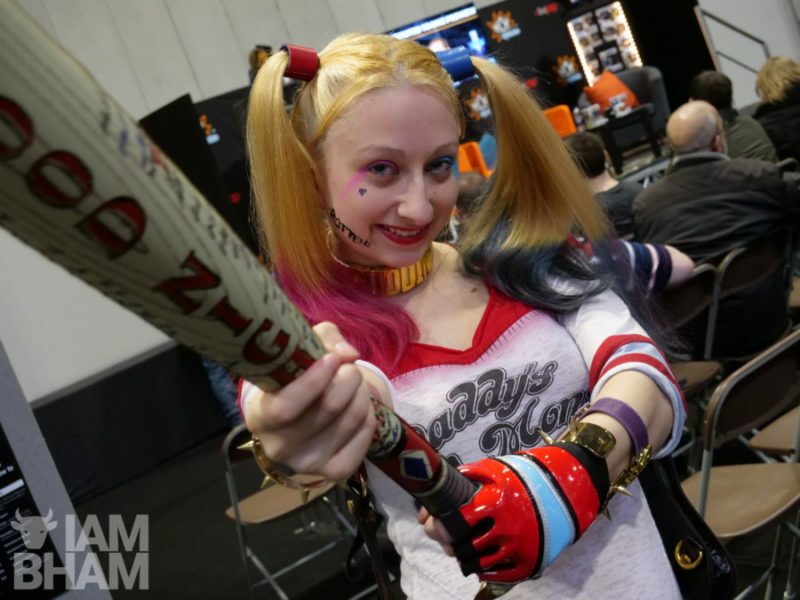 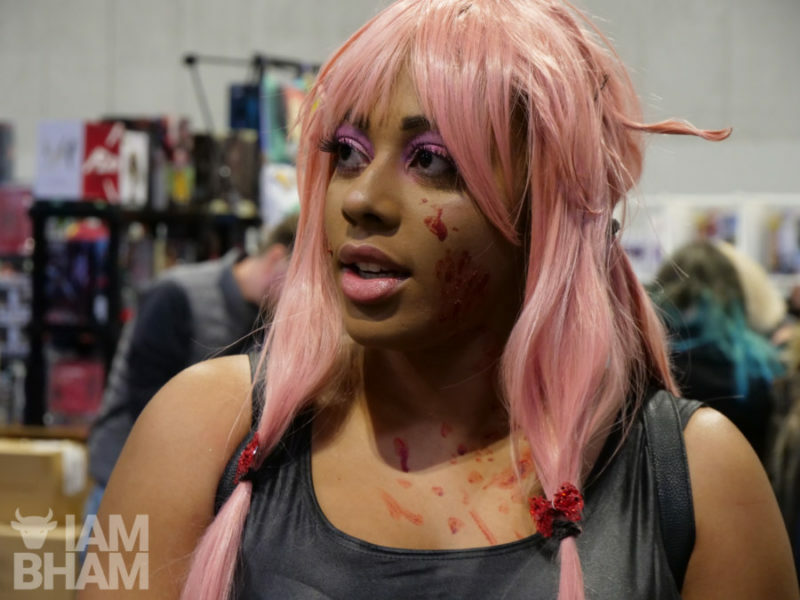 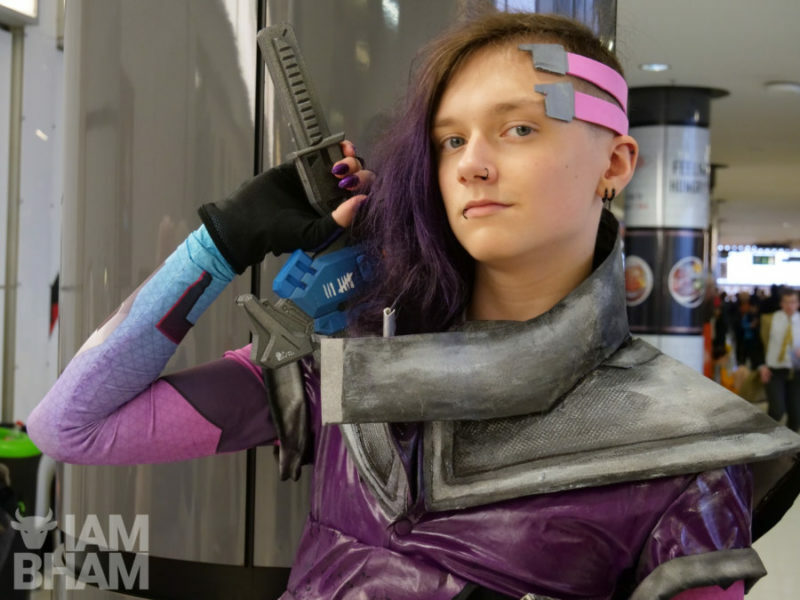 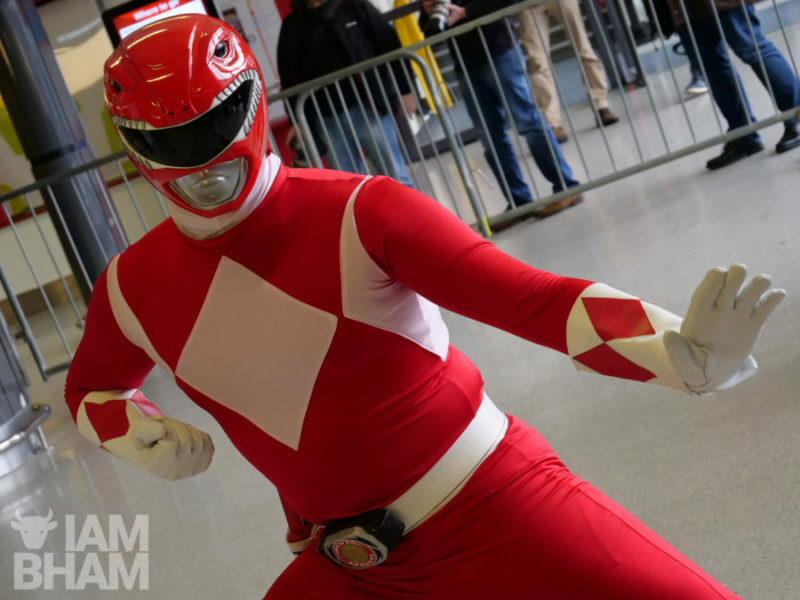 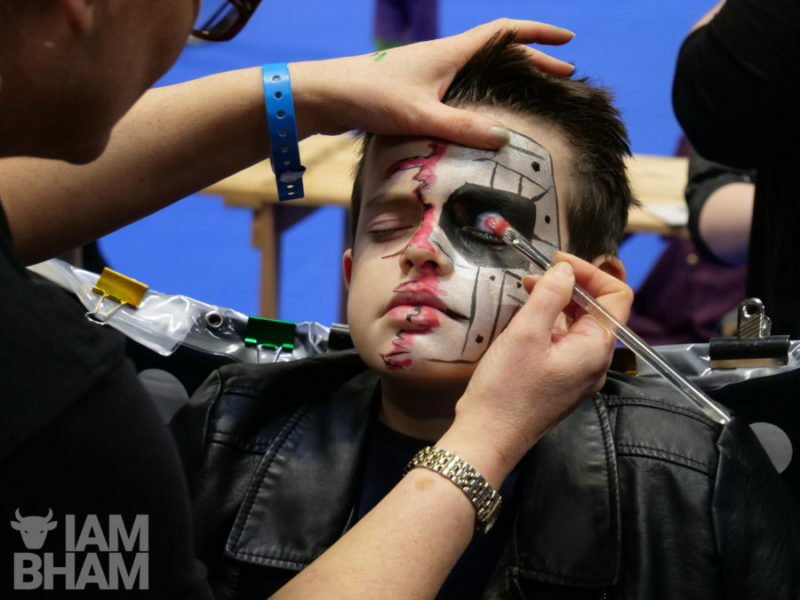 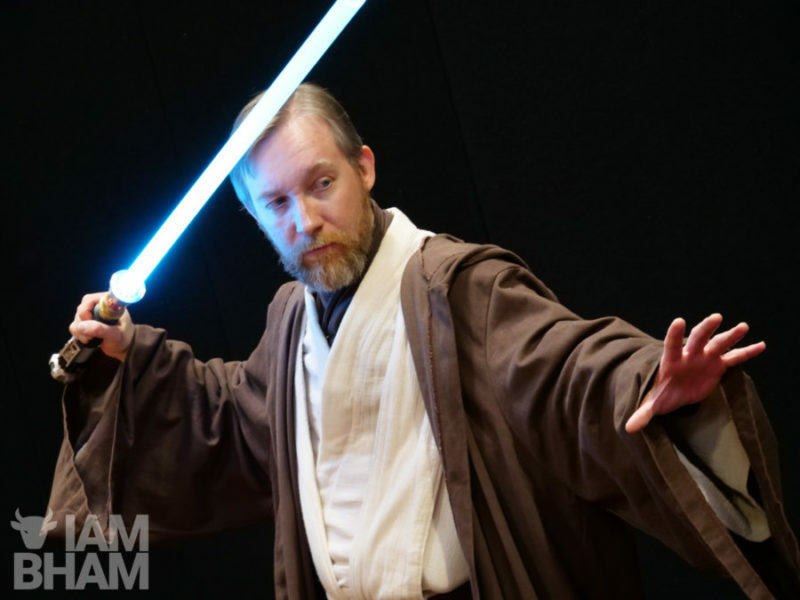 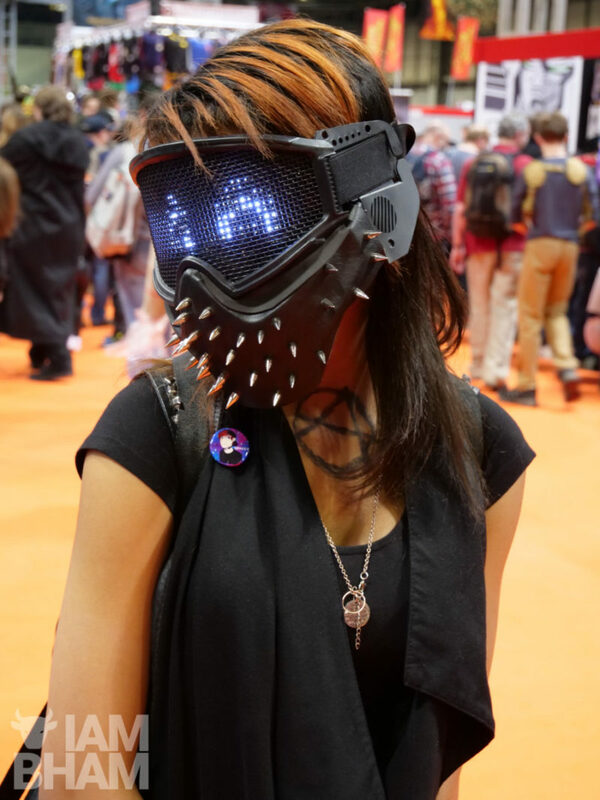 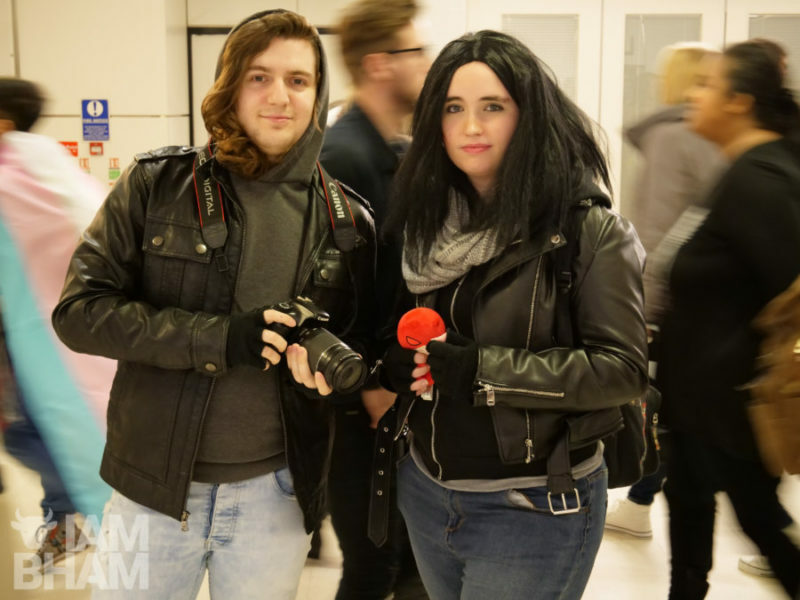 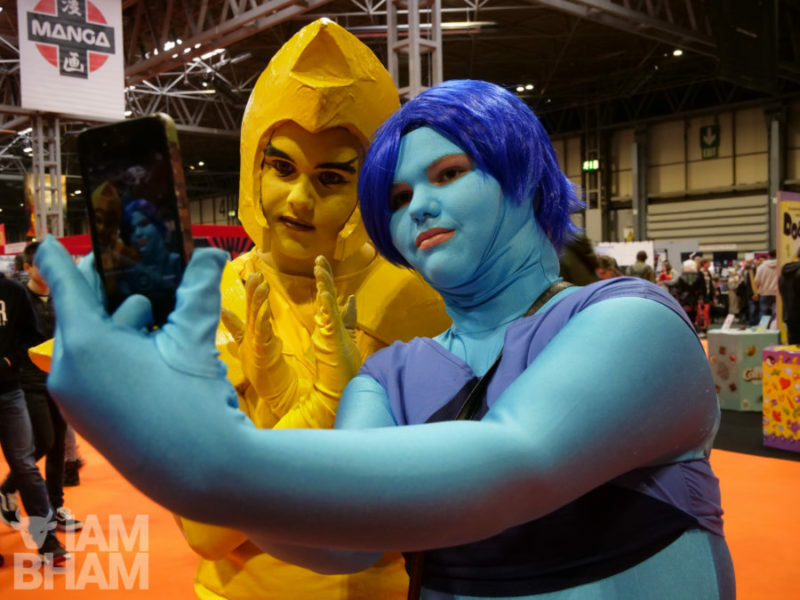 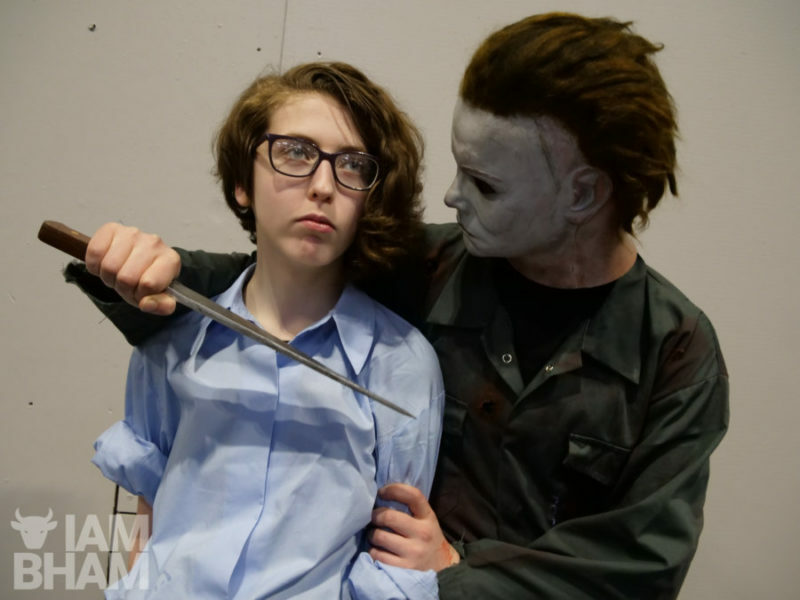 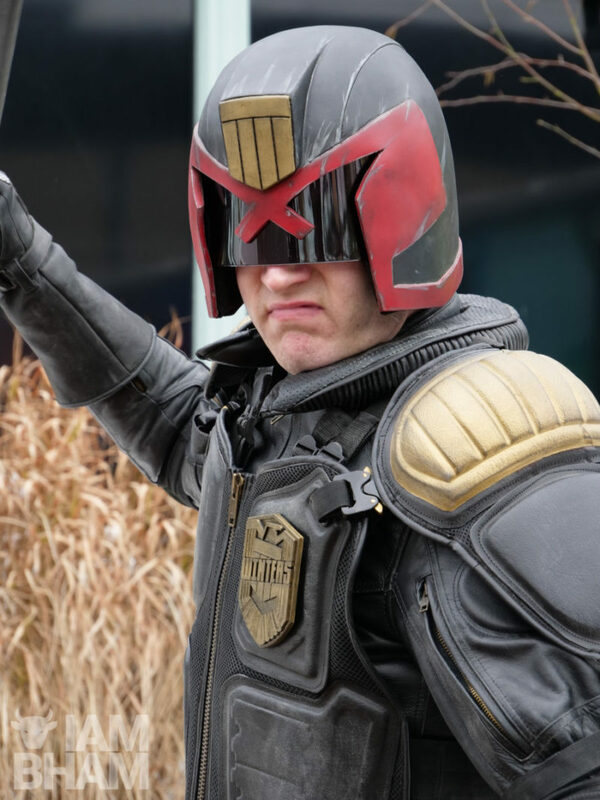 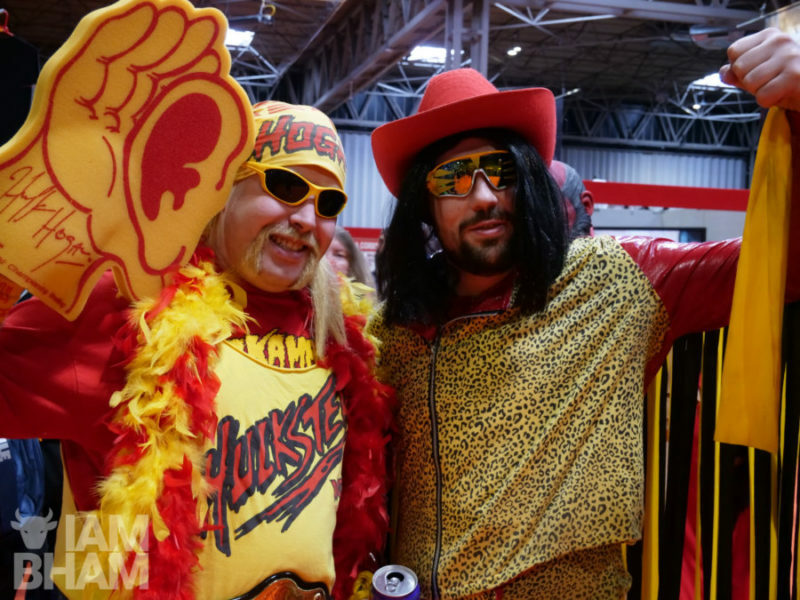 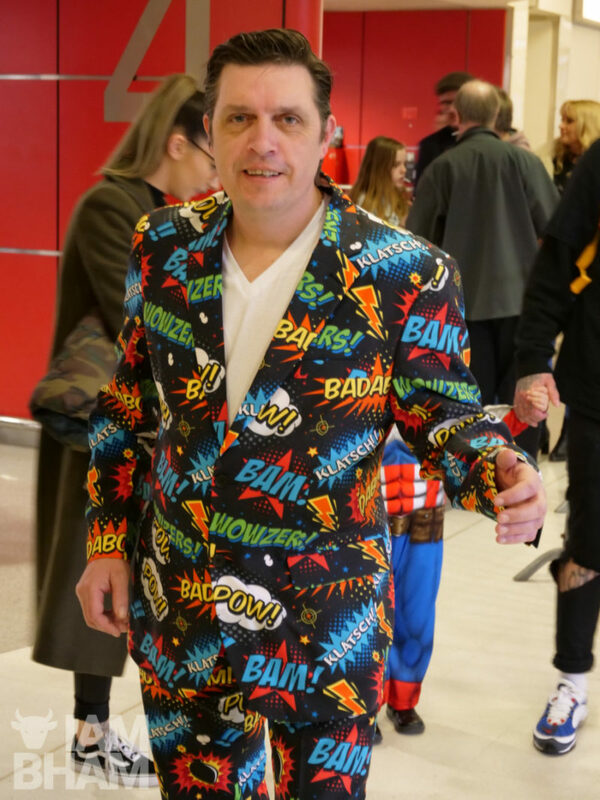 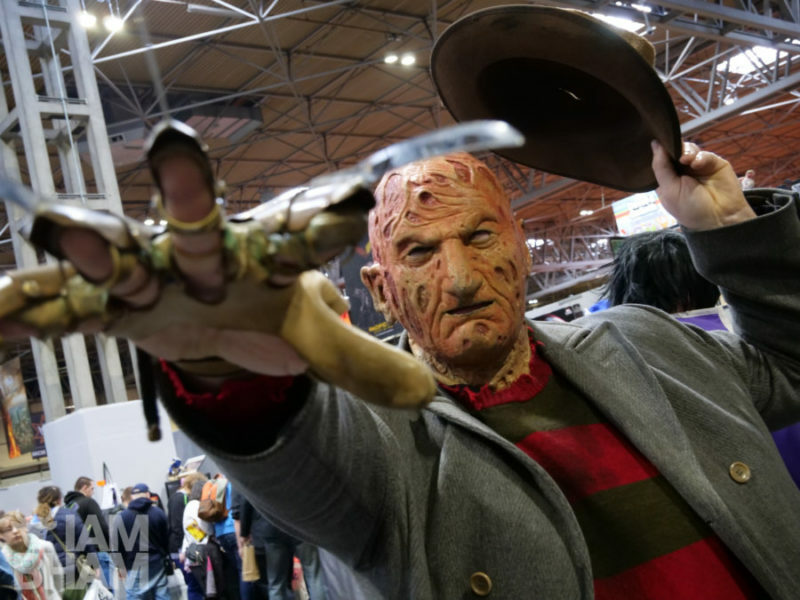 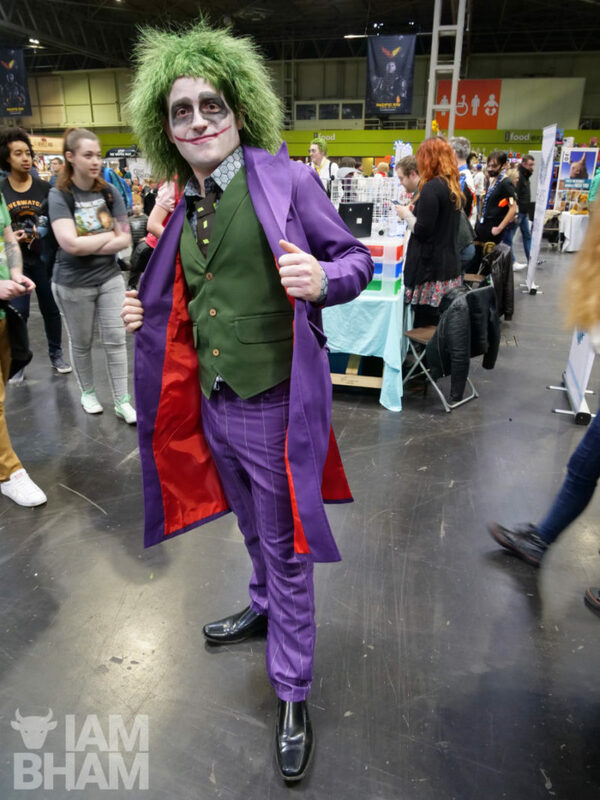 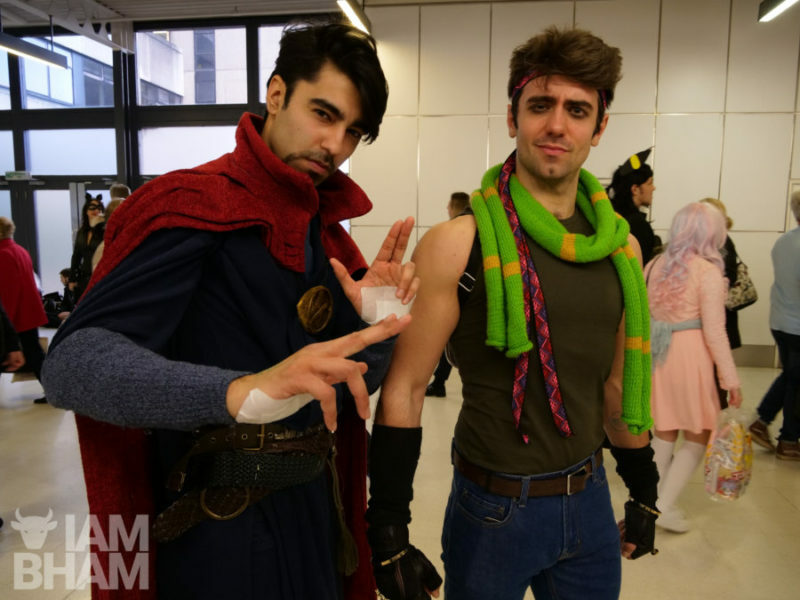 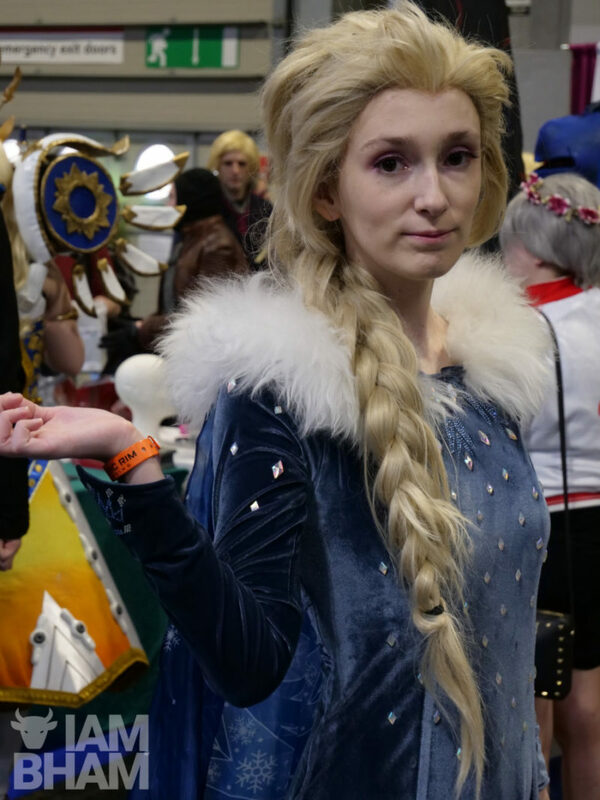 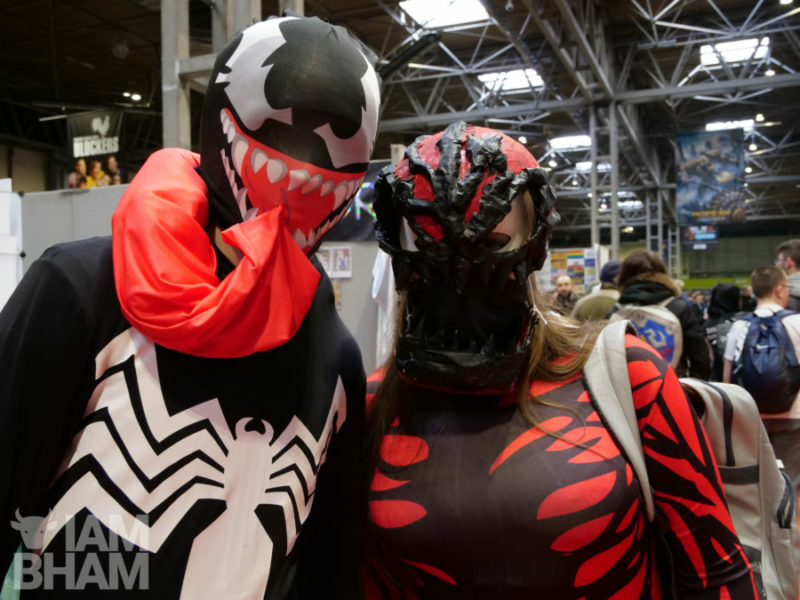 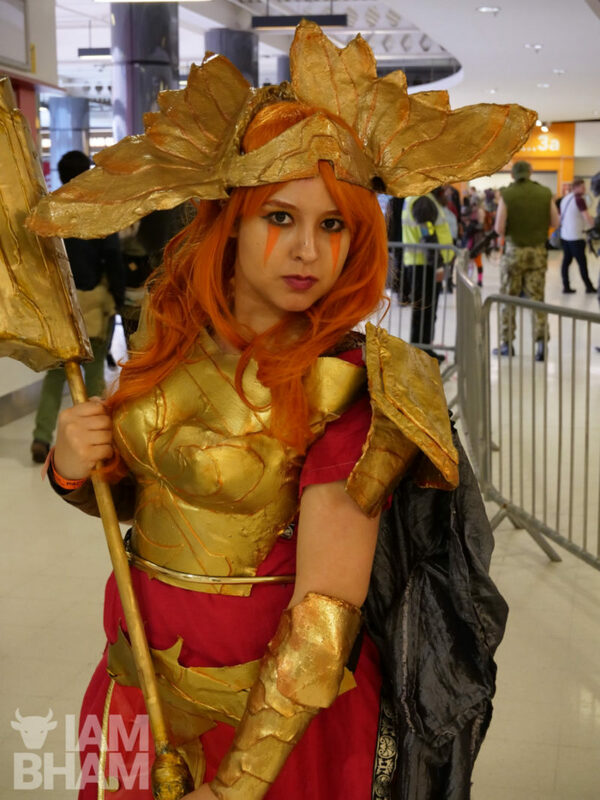 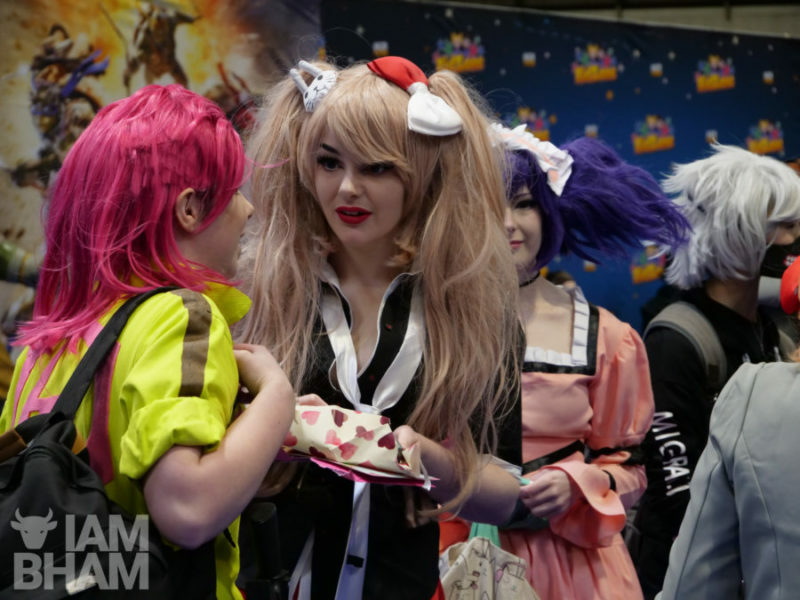 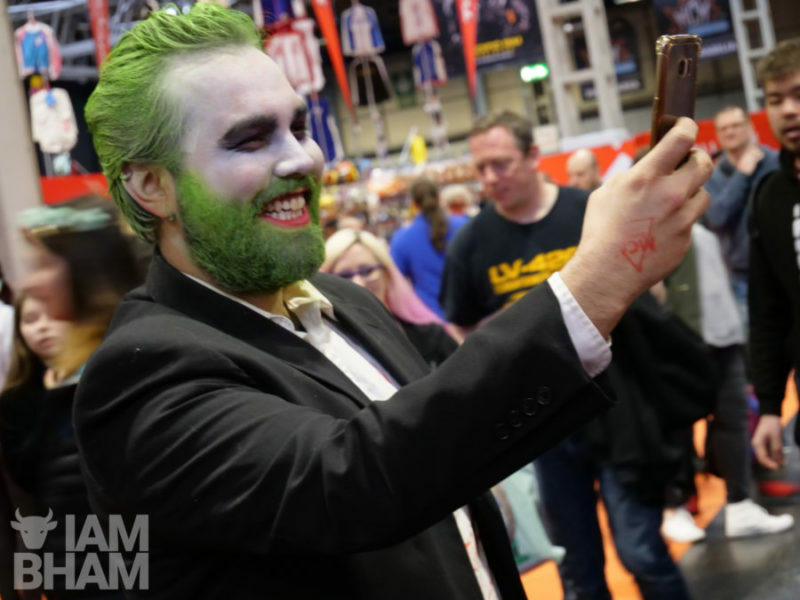 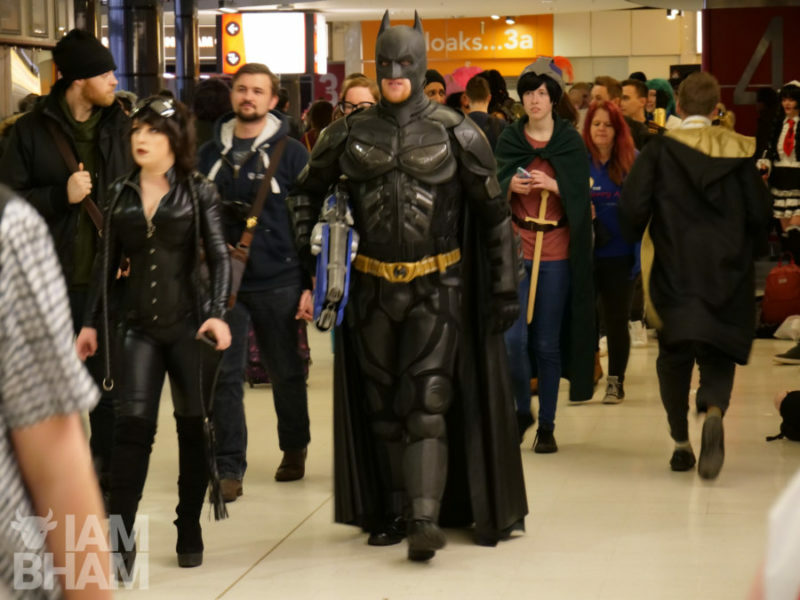 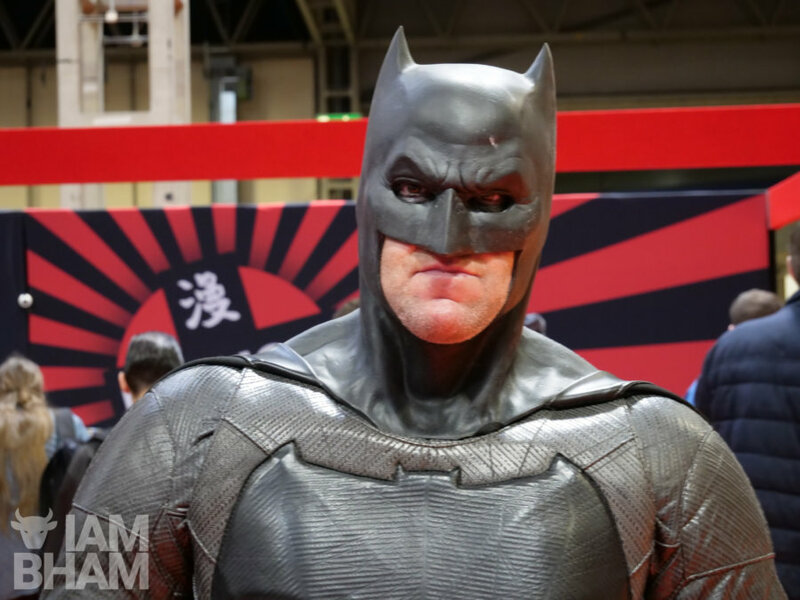 There’s plenty of attendees in cosplay, dressed up as popular characters from a whole spectrum of diverse mainstream and cult entertainment shows, movies and games. 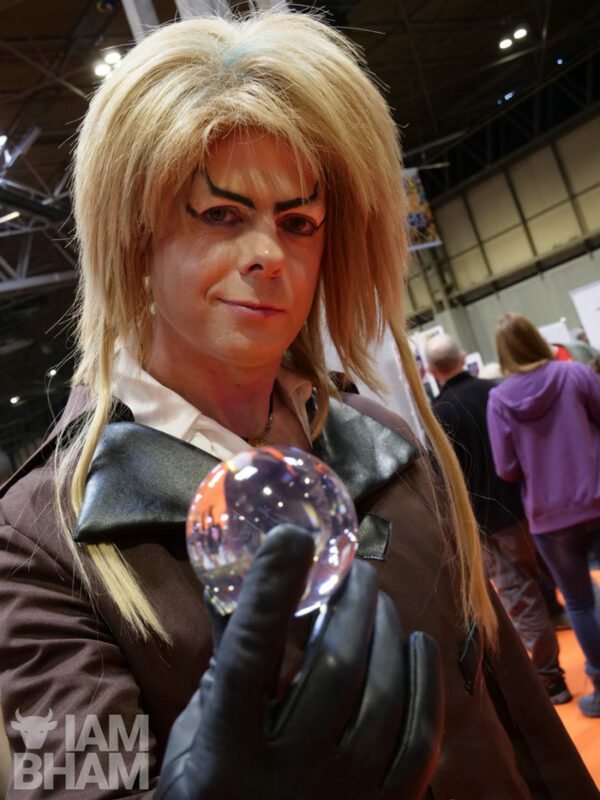 The show starts at 9am on both days this weekend, finishing at 6pm today and 5pm tomorrow.